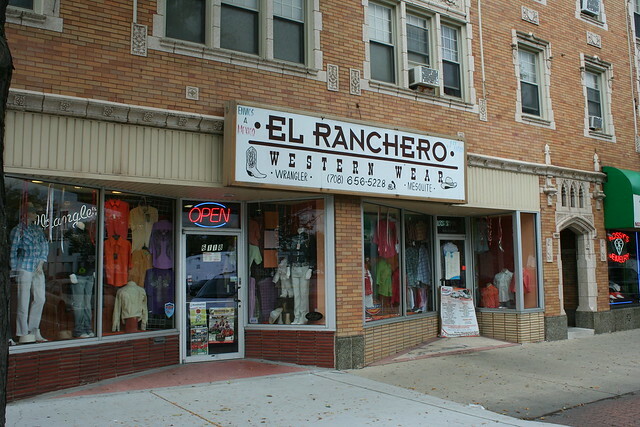 Head west out of Chicago on Cermak Road, and at first you may think you’ve come to the end of anything interesting. 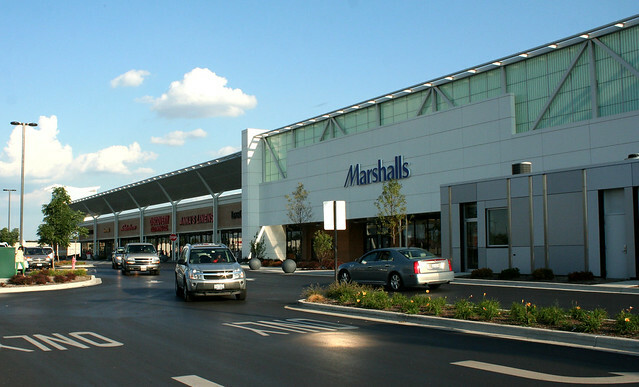 The first thing to greet your eyes after you cross the city boundary into Cicero is a series of bland strip malls. 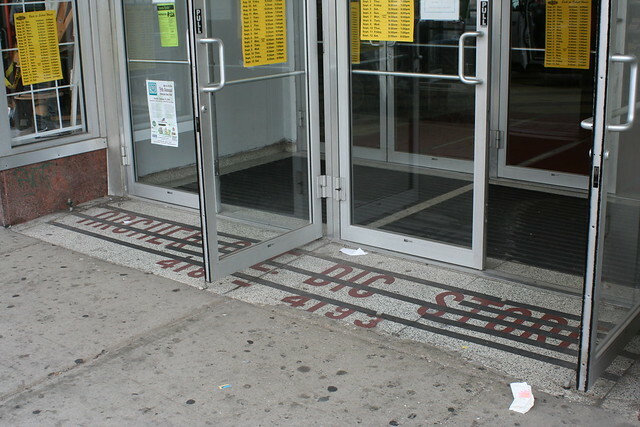 Nothing could be further from the truth, though. 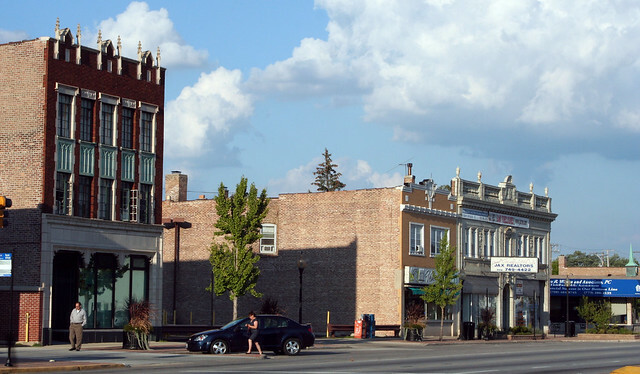 Once you cross Central Avenue, Cermak has many wonders in store as it cruises west through the inner-ring suburbs of Cicero and Berwyn. 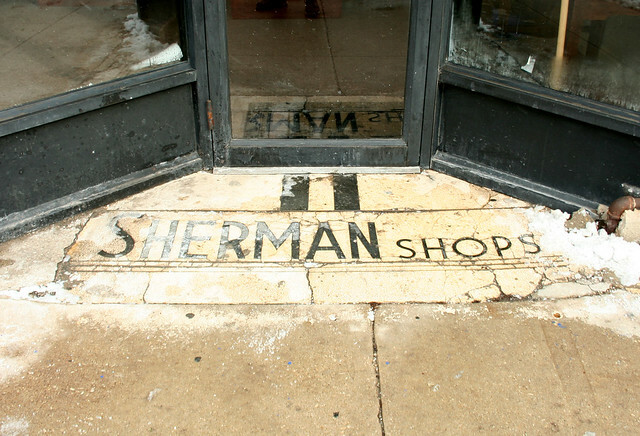 Cermak’s buildings gradually transition from pre-War revival and eclectic, to Mid-Century styles. 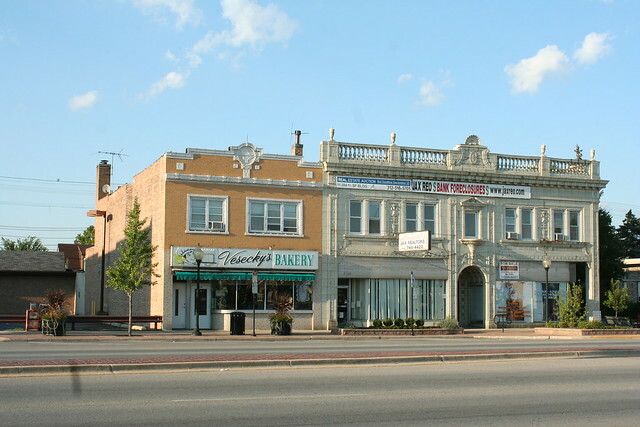 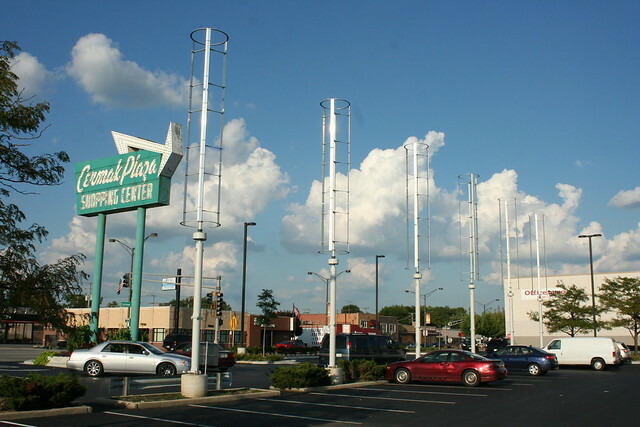 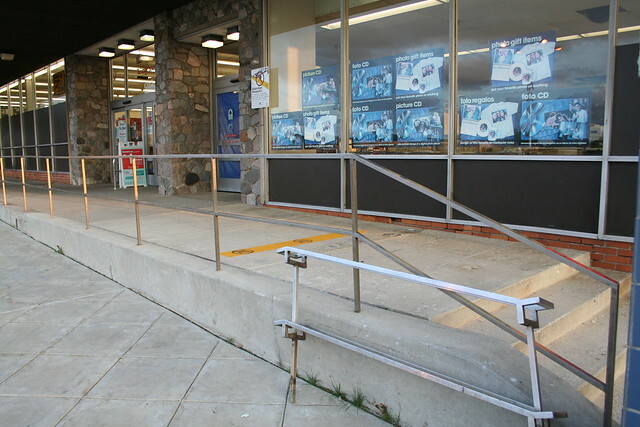 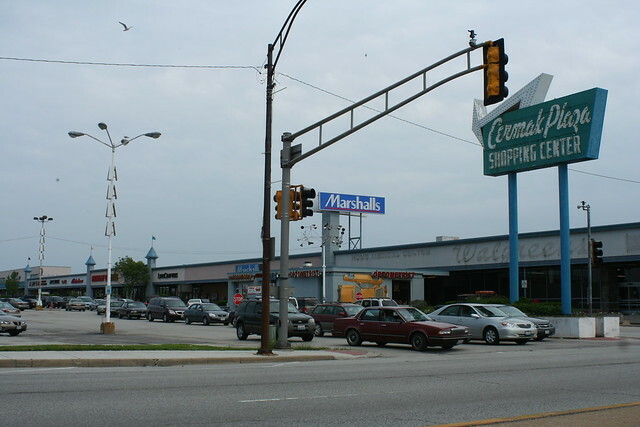 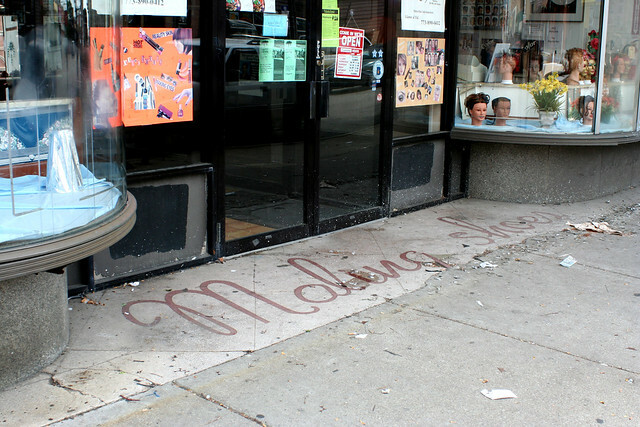 While grand commercial buildings from before World War II are scattered along the Cicero stretch of the road and and into eastern Berwyn – there is no visible transition at the political boundary – the Mid-Century buildings are primarily concentrated in western Berwyn, towards Harlem Avenue. 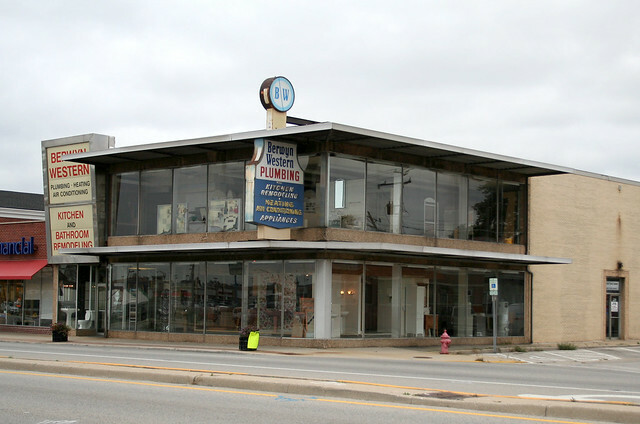 Berwyn Western Plumbing, 7100 W. Cermak Road, Berwyn – open by October 1962. 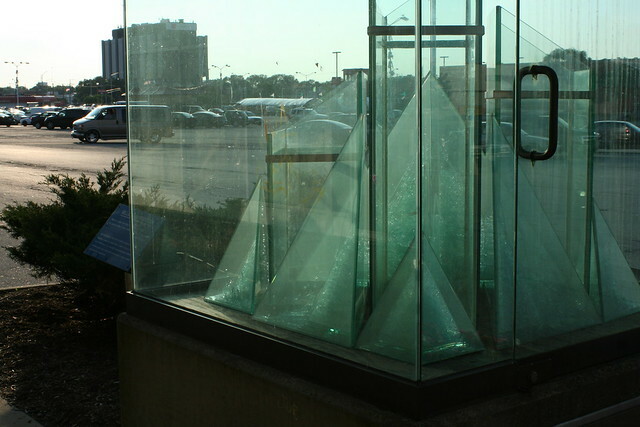 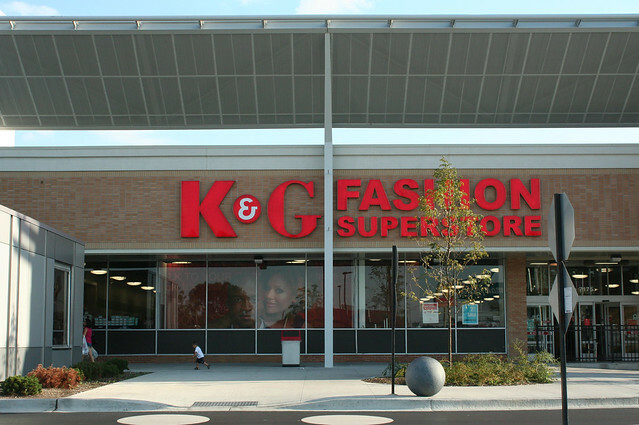 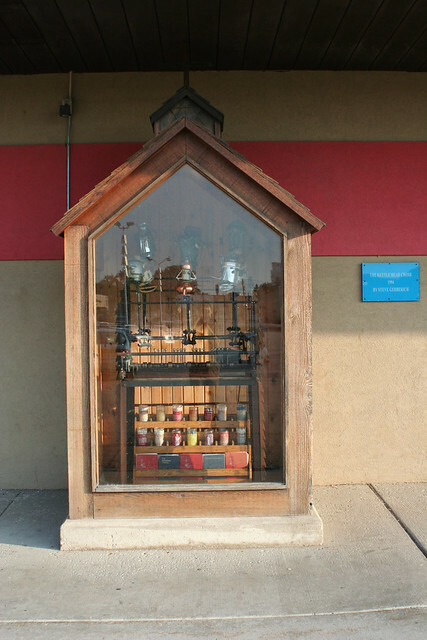 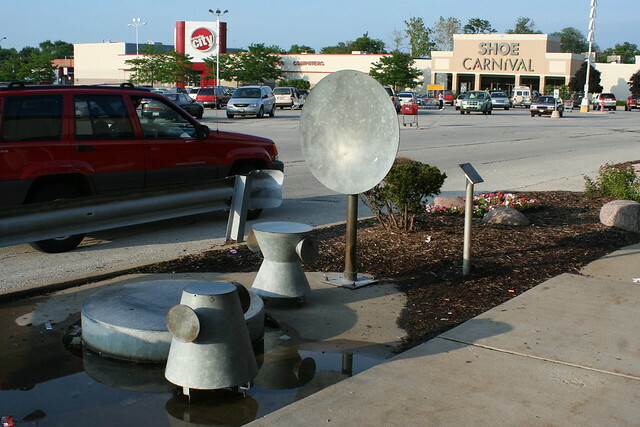 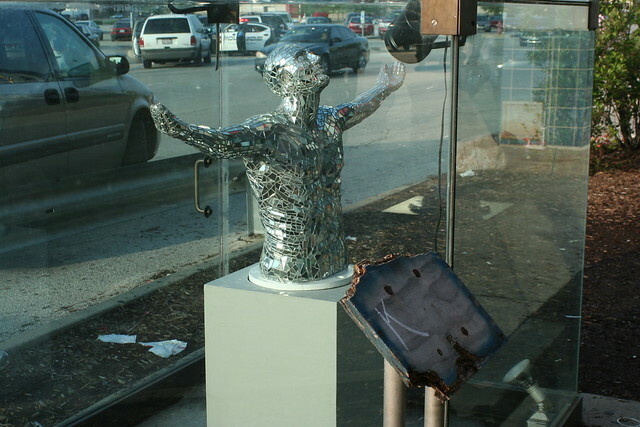 Two projecting sun shades with two walls of almost continuous glass between them – an ideal box for displaying a vendor’s wares. 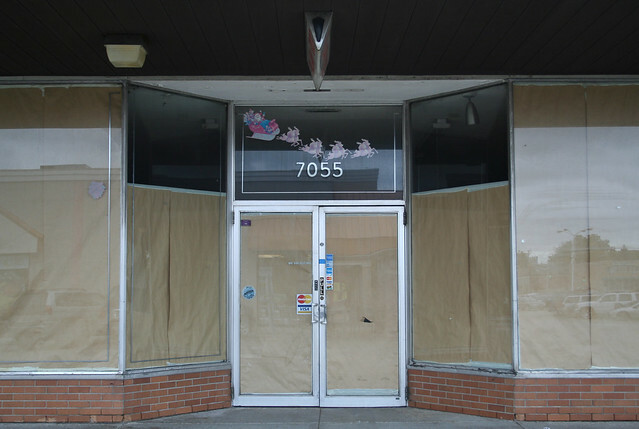 With the namesake business having relocated elsewhere, this building’s future is currently up in the air. 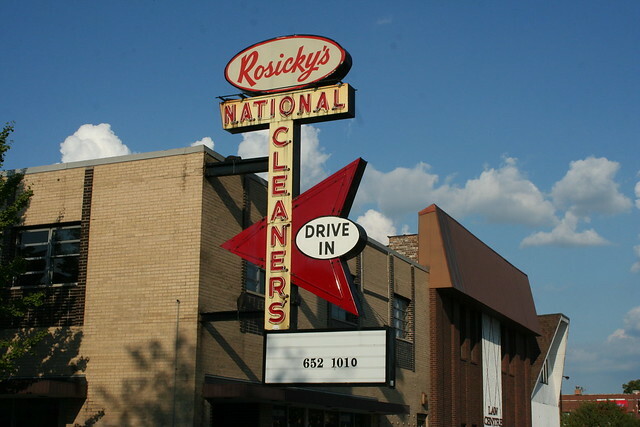 Rosicky’s National Cleaners, 5818 W. Cermak Road, Cicero. 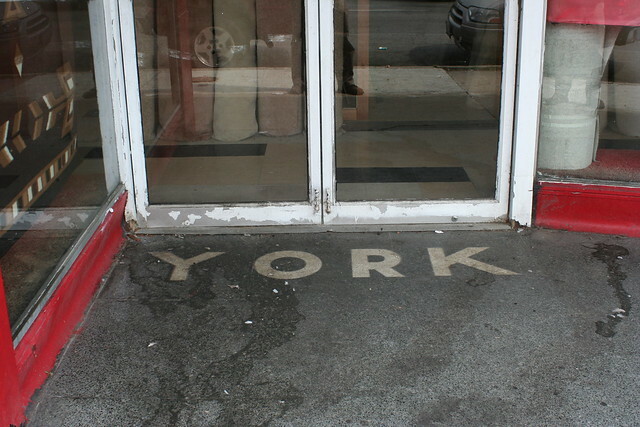 Open by 1966. 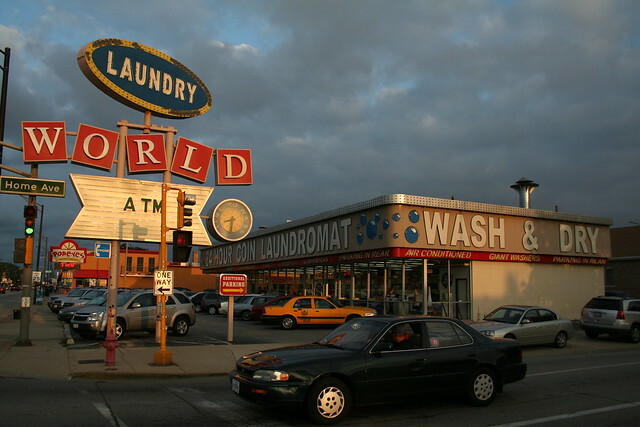 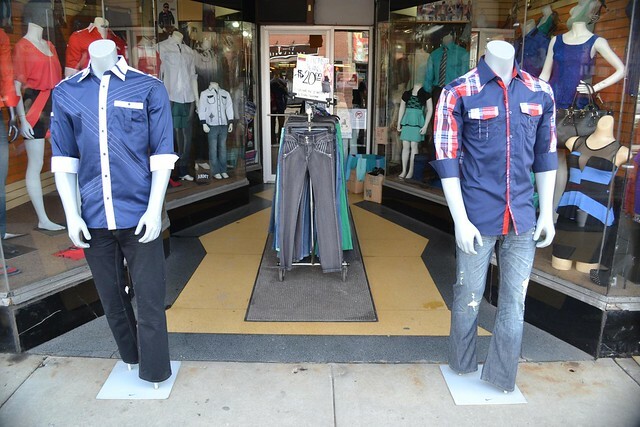 Laundry World, 6947 Cermak Road, Berwyn – present at this spot since the 1990s. 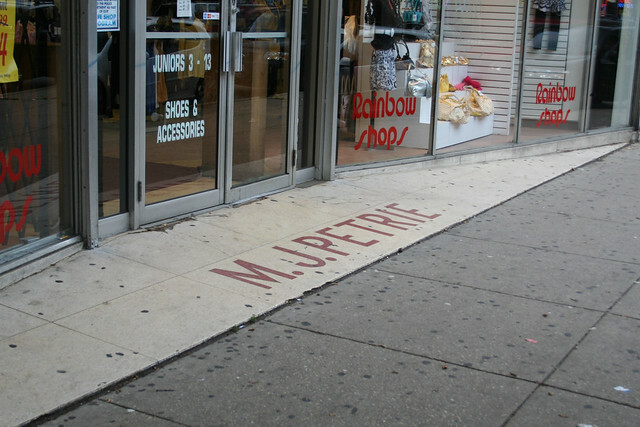 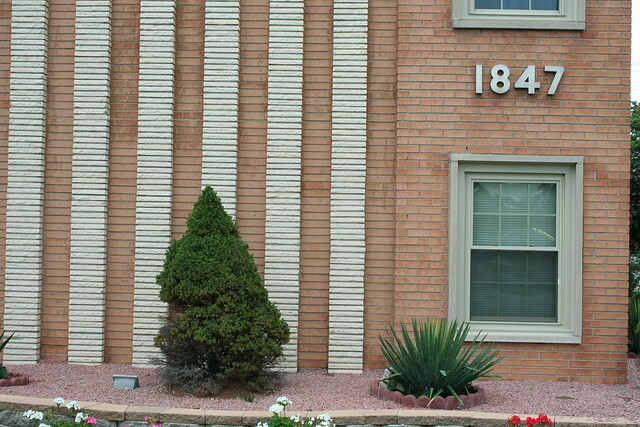 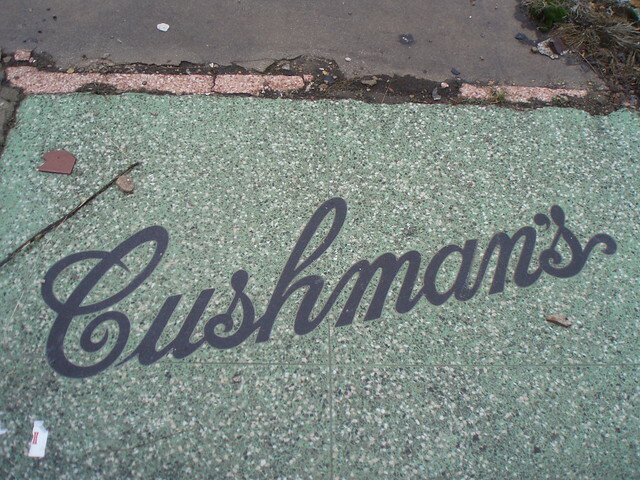 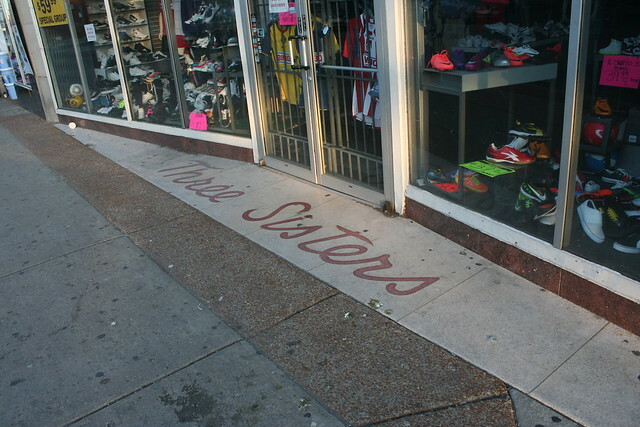 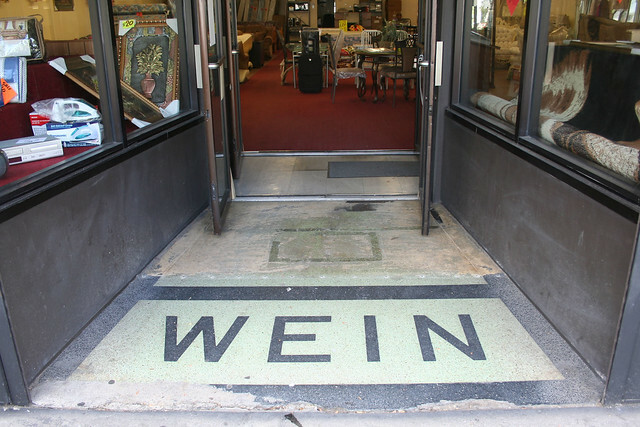 The sign is recycled from Color Tile, the previous occupant, who moved in in 1978 and stayed at least through 1990. 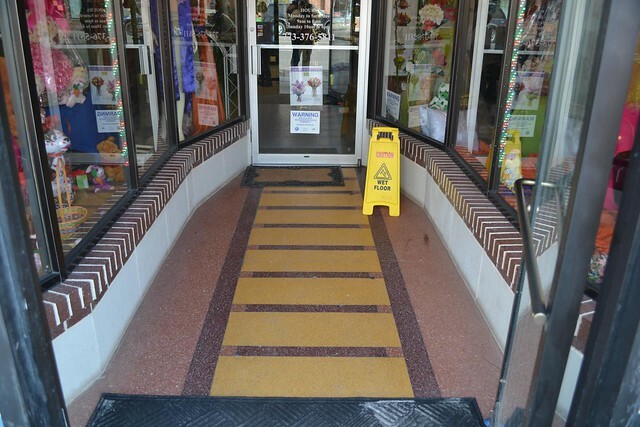 It’s not clear when the building was originally built. 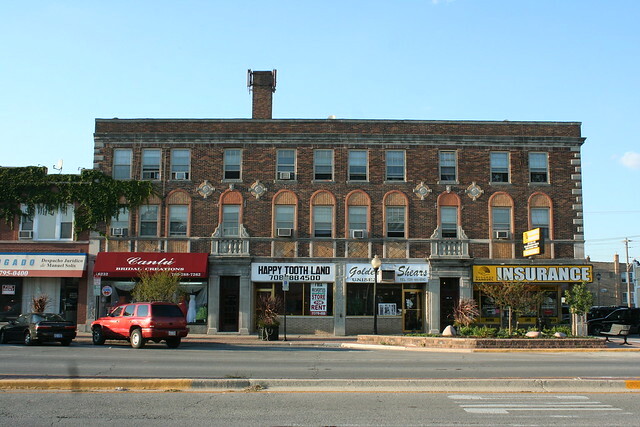 7008 Cermak Road – The Back Center, Berwyn. 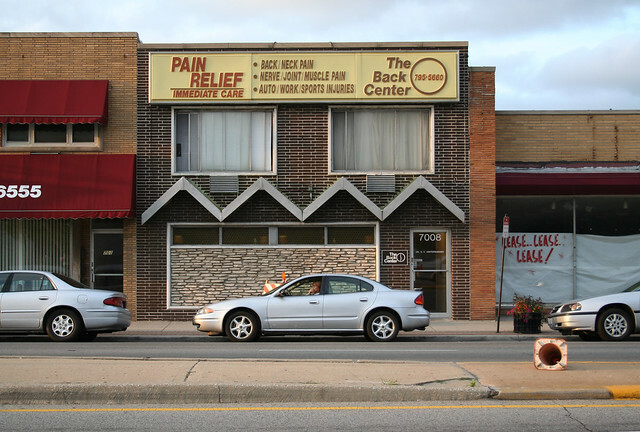 Alternately known as the West Suburban Chiropractic Clinic, the business has operated here since 1984. 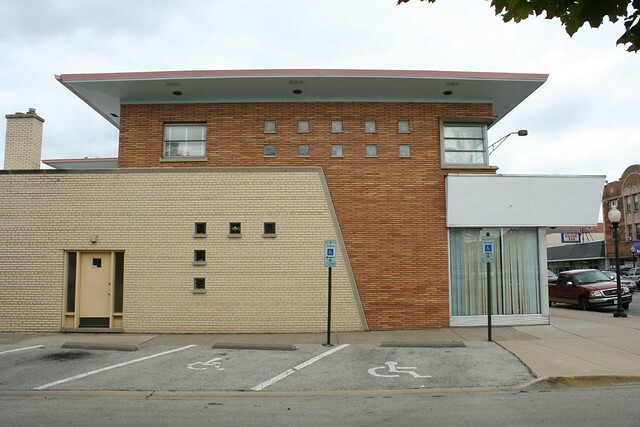 No word on its original life, but the high windows make a doctor’s office seem like a decent bet; mid-1960s seems a likely construction date. 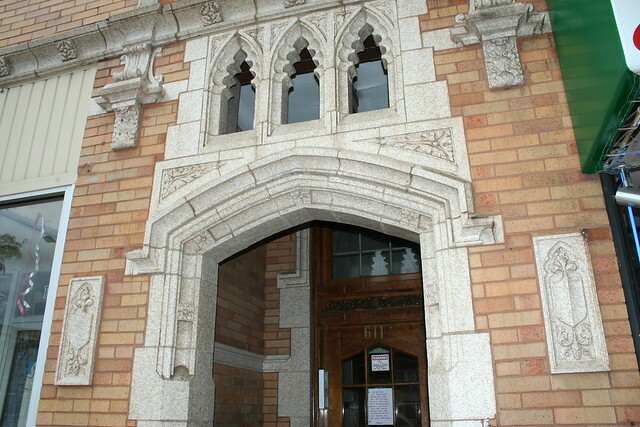 A recent “remodeling” has removed the primary points of interest, including the folded-plate canopy and the stacked stone panel at the ground floor. 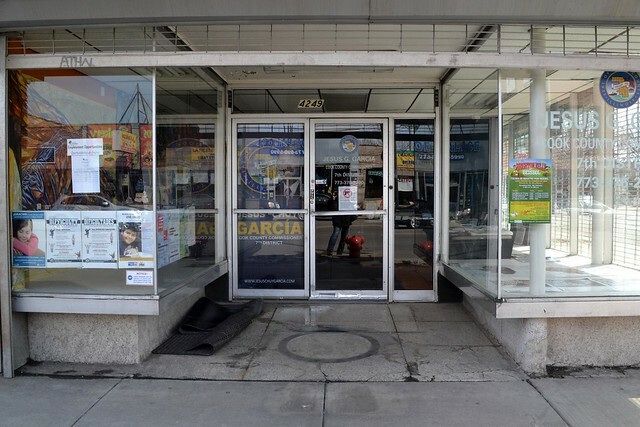 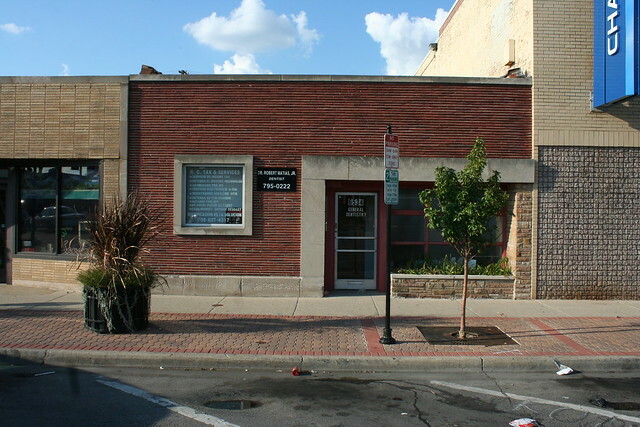 6534 W. Cermak Road, Berwyn – General Dentistry. 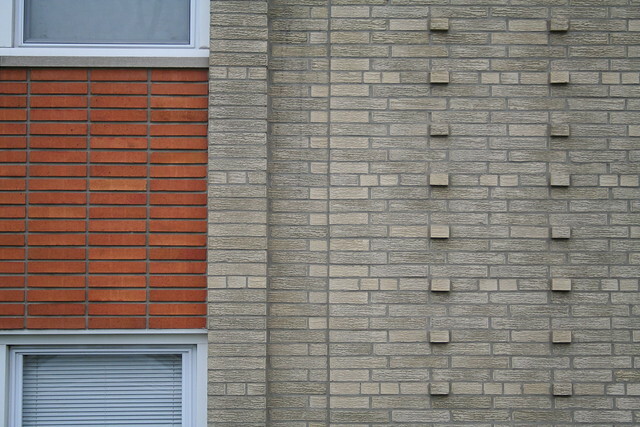 Two buildings of red Roman brick with limestone banding. 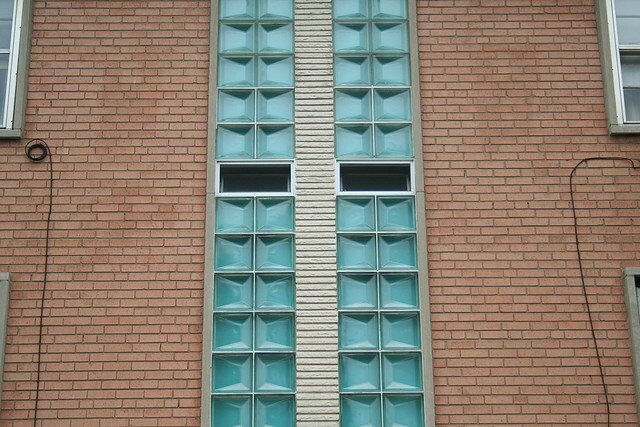 The latter, in particular, is a powerful yet simple geometric composition. 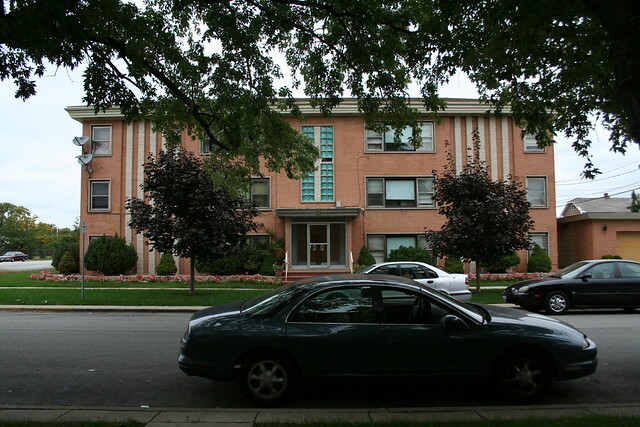 6913 W. Cermak Road, Berwyn. 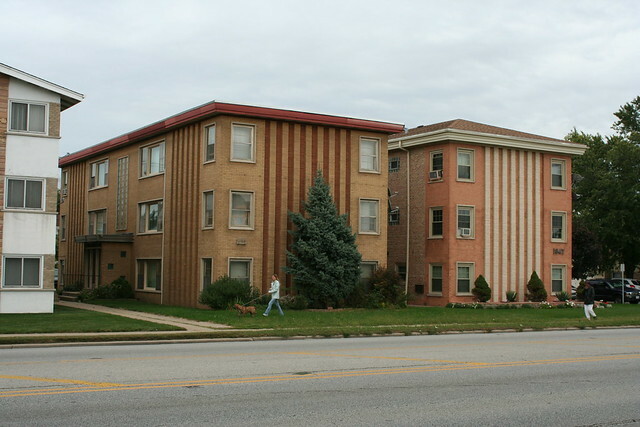 The vertical stripe/flag element at left is the primary point of “flare”; the rest of the building is stock 1950s components – orange-blonde brick, limestone banding, bottle glass and metal spandrel panels on the stairwell, and ribbons of metal-framed windows. 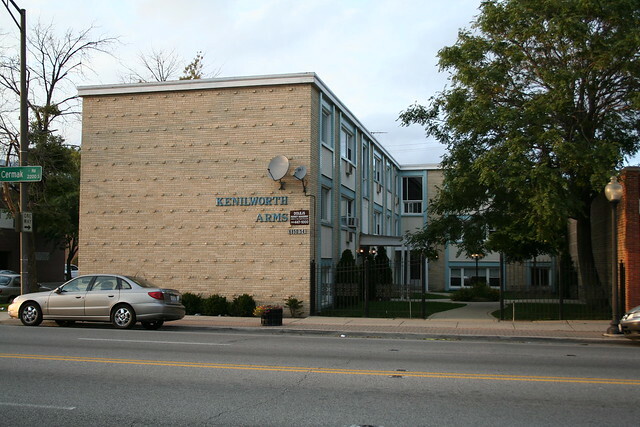 Kenilworth Arms Apartments, 6850 W. Cermak Road, Berwyn – a 1959 building by George V. Jerutis & Associates builders, who will be covered in an upcoming post. 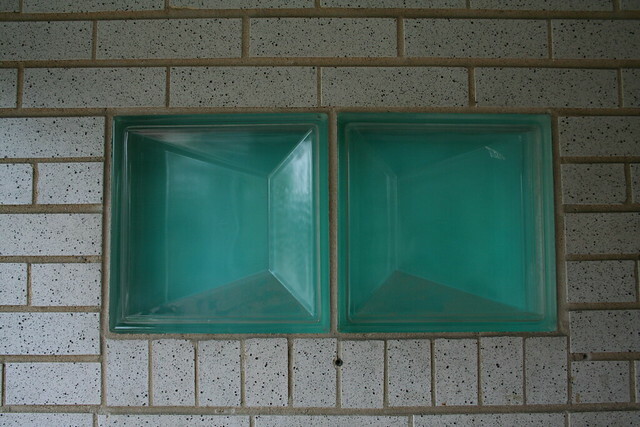 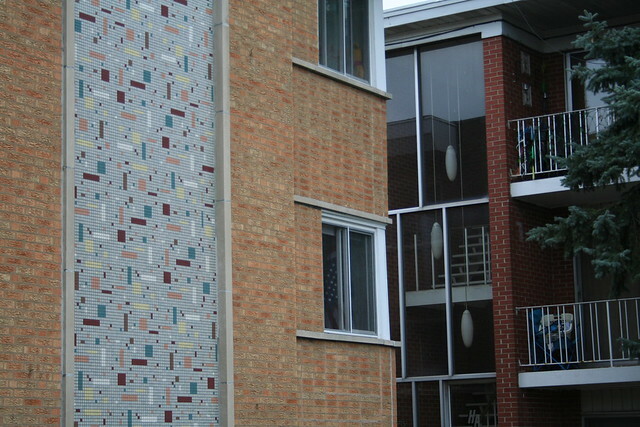 This one features the glazed baby blue brick which appears on dozens of north side apartments, and an offset grid of projecting bricks on the otherwise blank end wall. 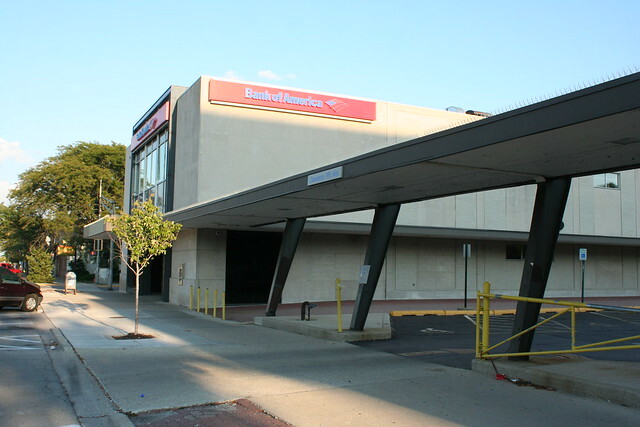 Bank of America – 5801 W. Cermak Road, Cicero. 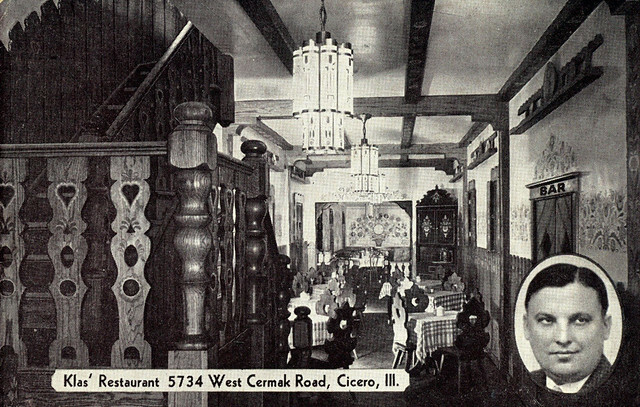 Originally the Western National Bank of Cicero, a bank founded in 1913. 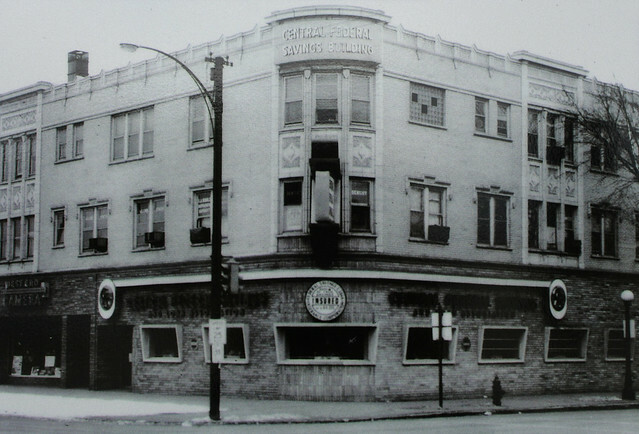 They moved to this, their new location, in May 1960, vacating a NeoClassical building which still stands two blocks east. 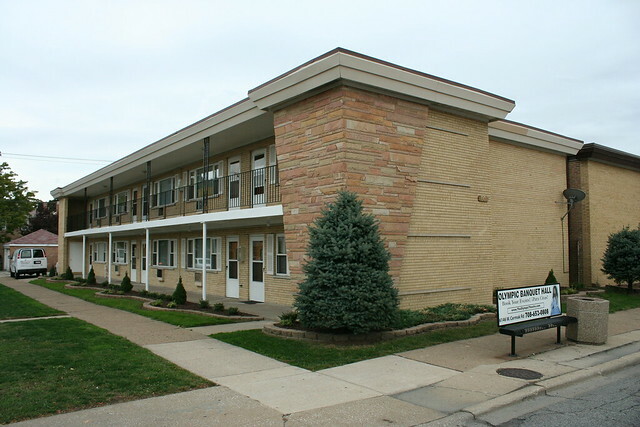 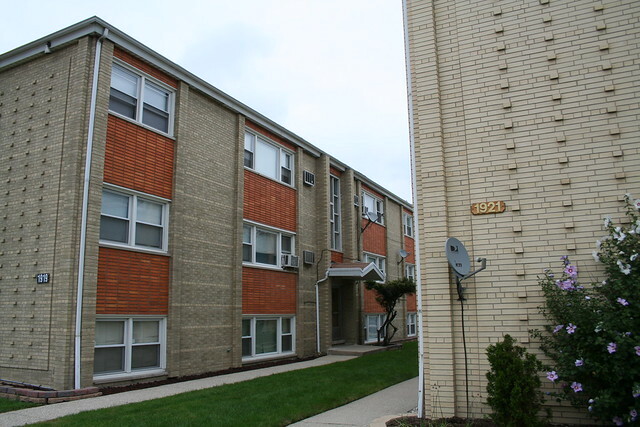 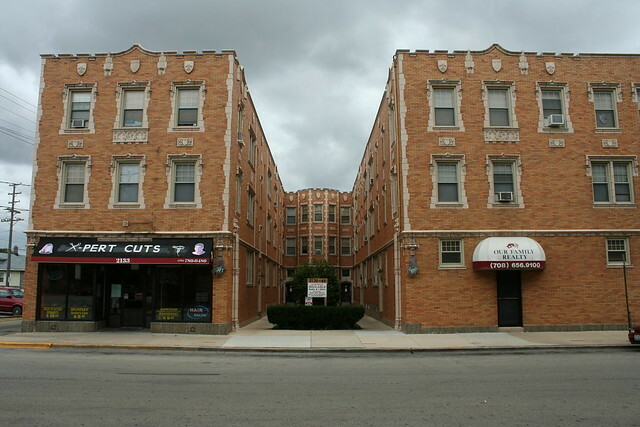 6901 W. Cermak Road, Berwyn – a mixed-use residential/commercial building, opened in 1957. 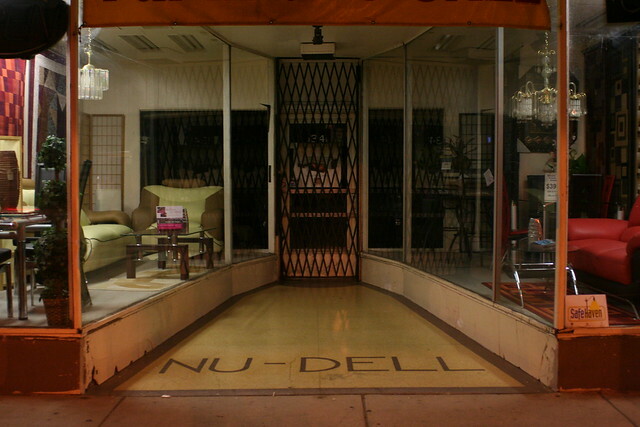 Among the first ground floor tenants was a Niagra massage chair showroom. 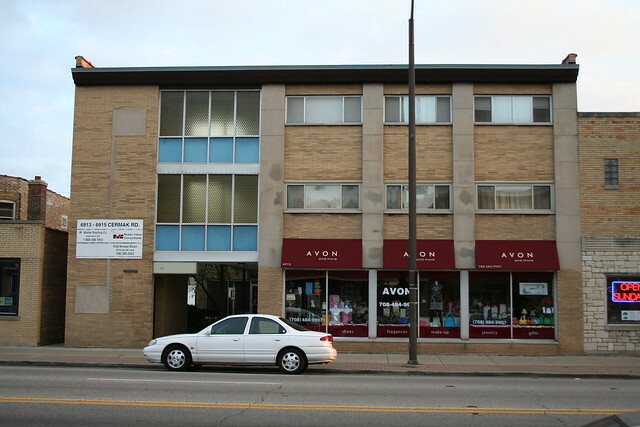 Sharon Beauty Supply – 5817 W. Cermak Road, Cicero, 1959 – originally Clyde Savings and Loan Association, founded in 1914. 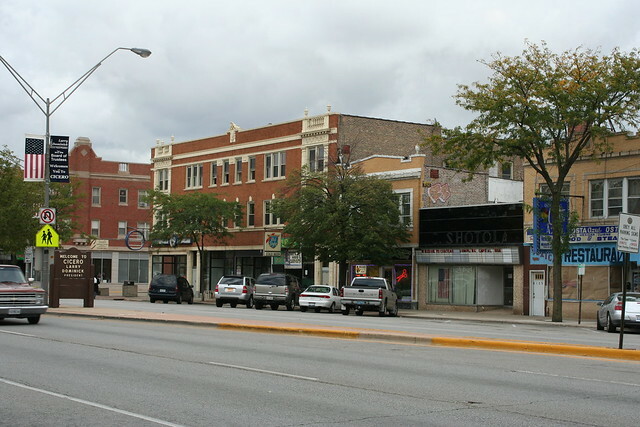 The left-most portion of the building dates back at lest to the 1940s; the current look dates to a 1958 remodeling designed by Chicago Bank Building and Engineering Company, which extended the building west to the corner. 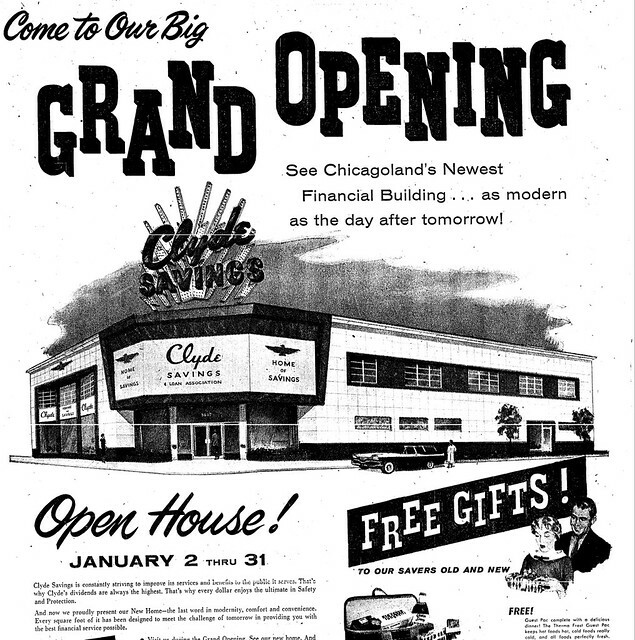 The remodeled building opened in January 1959. 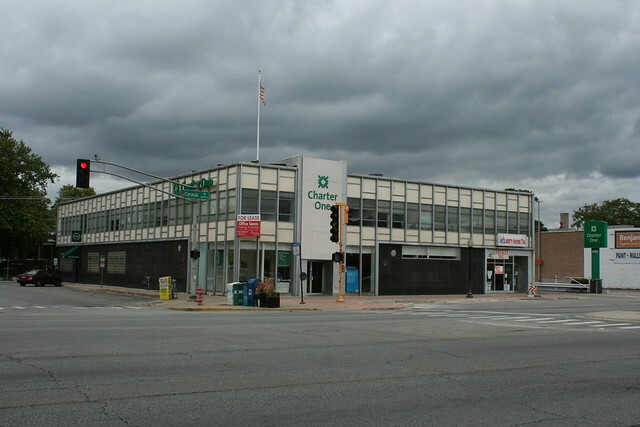 Charter One Bank – 6201 W. Cermak Road, Berwyn – a pre-war building remodeled in the International Style. 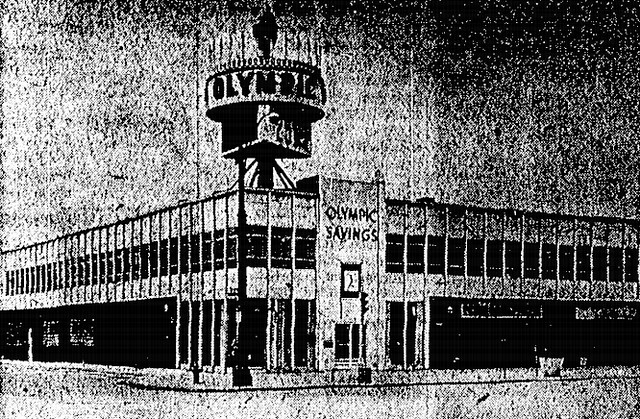 Originally Olympic Federal Savings and Loan Bank, founded in 1937, the building was expanded and remodeled in 1962, opening in June. 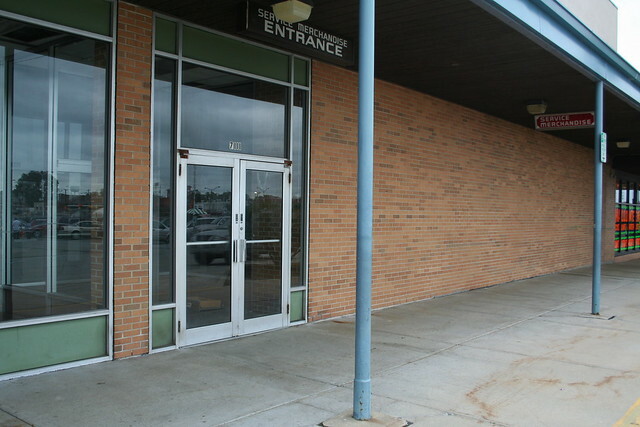 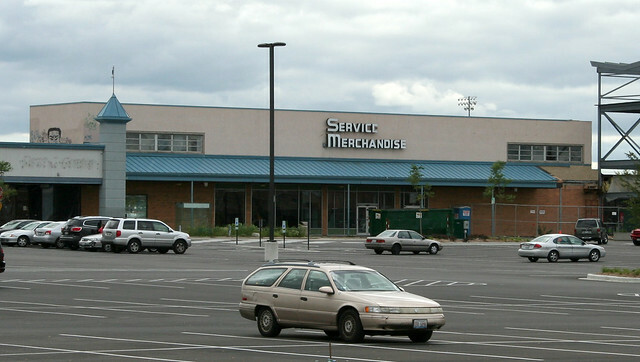 The post-remodel building sported a tall round sign over the corner. 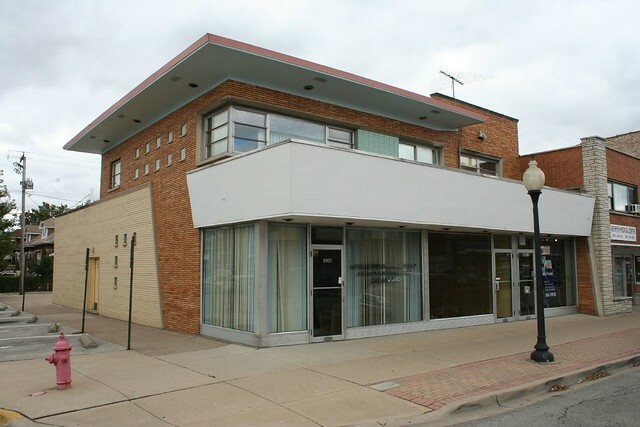 BMO Harris Bank – 6655 W. Cermak Road, Berwyn, 1957 – originally Lincoln Federal Savings and Loan. 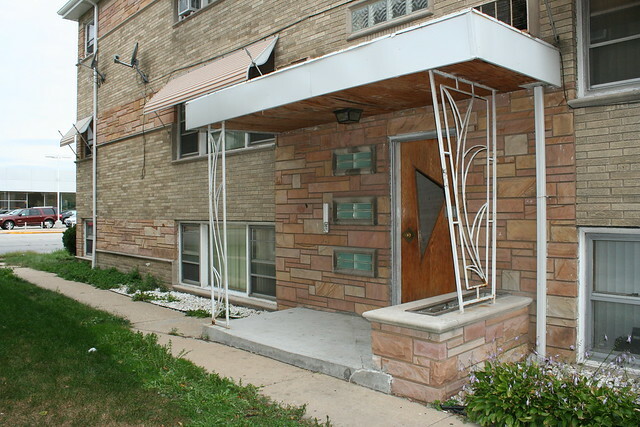 Angled walls of flagstone, alternating with metal panel spandrels and a storefront system, as well as sunshade fins, mark it as a high Mid-Century design. 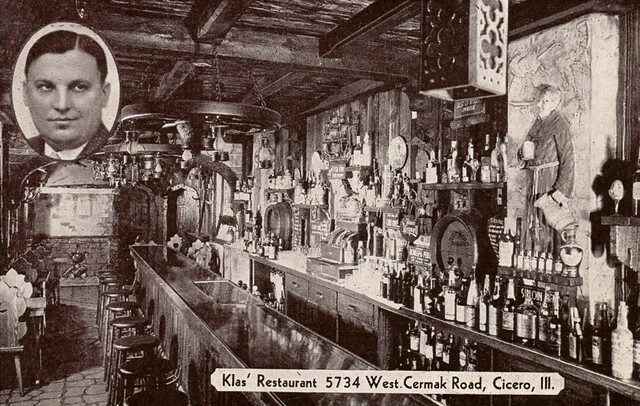 See a 1958 postcard view of it in its original glory here, just after it opened. 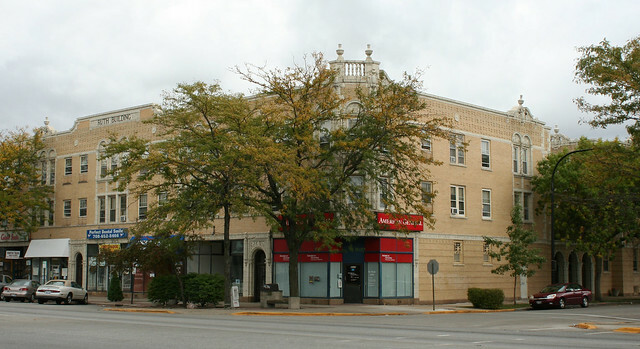 The bank had previously been Lombard Bank, but a custodian working there passed along his interest in President Lincoln to the bank’s president – who changed the company’s name, had two statues of the President commissioned for the property, and included a Lincoln library in the new building. 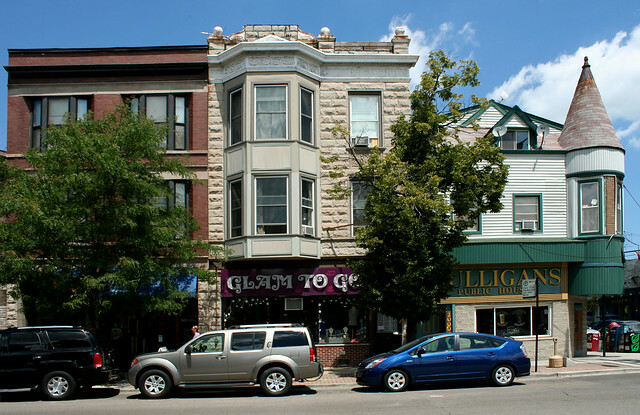 Travel the major commercial streets of Chicago, and you’ll find a particular breed of structure that I have short-handed as the “corner commercial” building – 2- and 3-story structures with brick exteriors and terra cotta ornament, trending toward the Gothic in their details, more often than not sited on a corner lot. 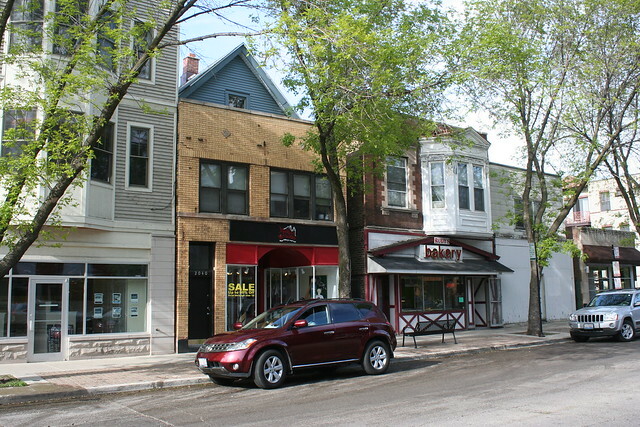 Apartments or office space on the upper floors, small storefronts at the sidewalk. 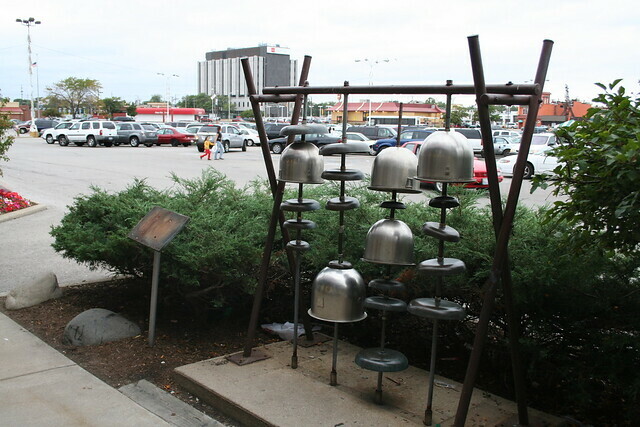 They are plentiful on streets like Western, Lincoln, Cottage Grove, and many others. 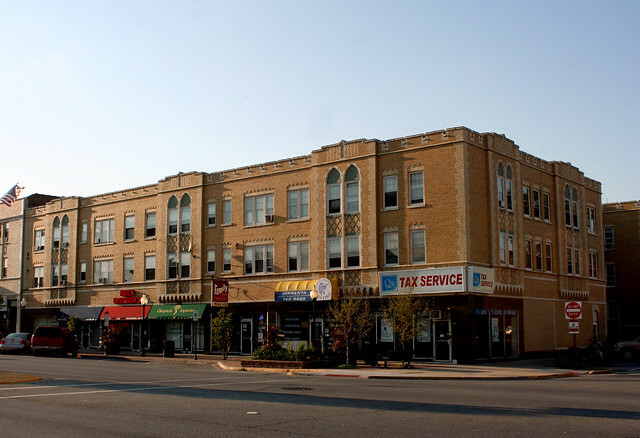 A particularly large and outstanding collection of corner commercial buildings can be found on Cermak Road as it passes through Cicero and Berwyn, both of which boomed in the 1920s. 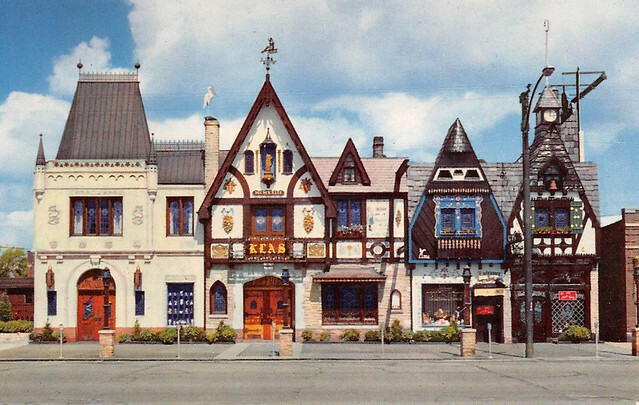 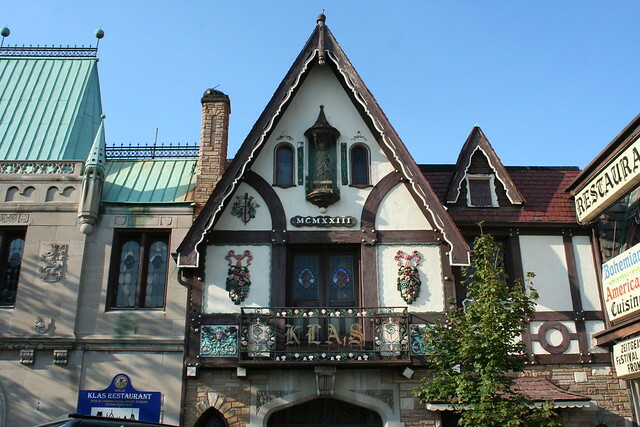 The population at the time was dominated by Czech immigrants, whose immigration to the US had reached a peak just before World War I; their descendants have largely moved onwards, replaced today by Hispanic populations – but some traces of their presence remains in their buildings. 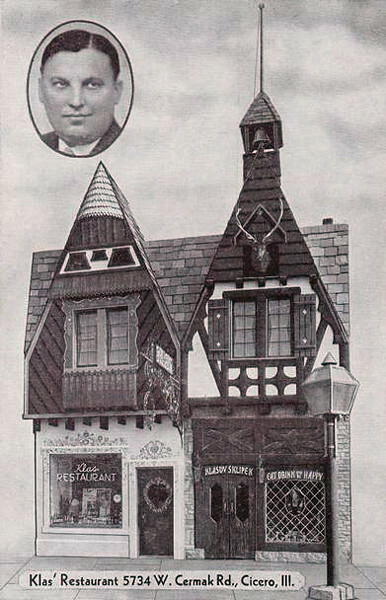 Virtually all of the examples below were erected between 1921 and 1929. 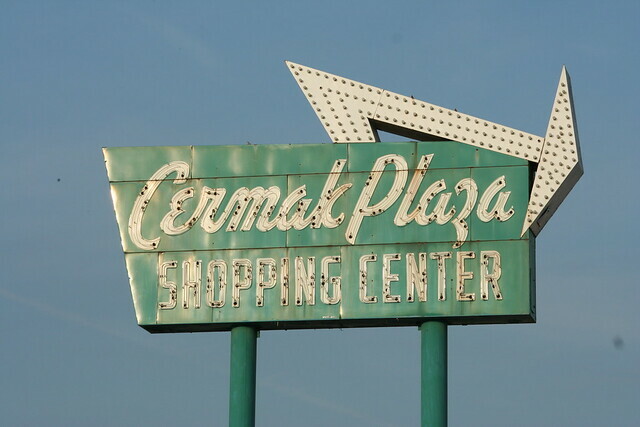 Curiously, I can find no record of them in the Tribune before 1930 – and yes, I did check under Cermak’s prior name, 22nd Street. 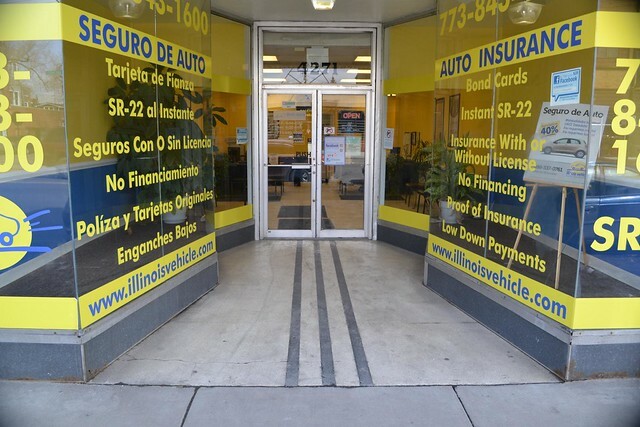 I suspect that, in the tightly wound immigrant community, advertising in a regional paper like the Tribune simply wasn’t necessary to fill your apartments and hawk your wares. 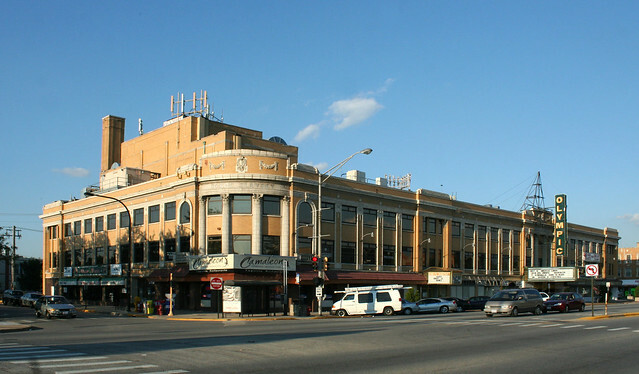 Queen of them all is the Sokol Slavsky building (“Slavic falcon”), constructed in 1927 to the designs of architect Joseph J. Novy (6130 W. Cermak). 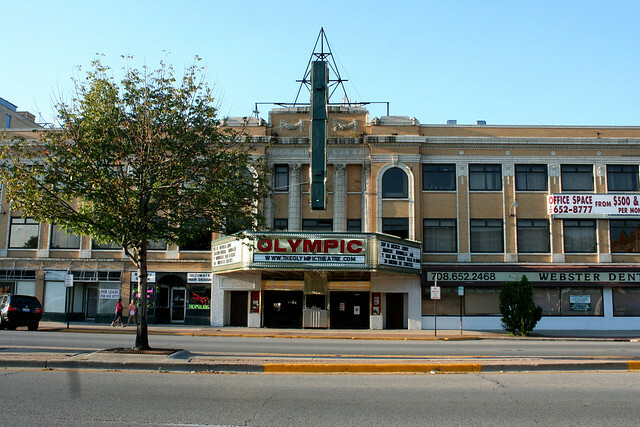 The building takes up the entire block; in the center is the Olympic Theatre, built as a grand ballroom and concert hall, and later converted to a movie theater. 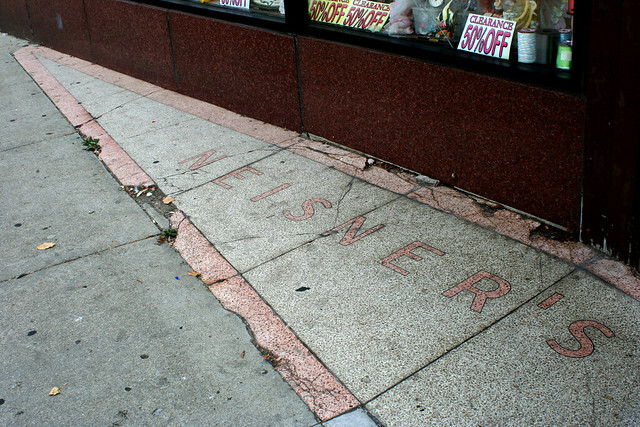 The theater is decorated with sprawling painted murals. 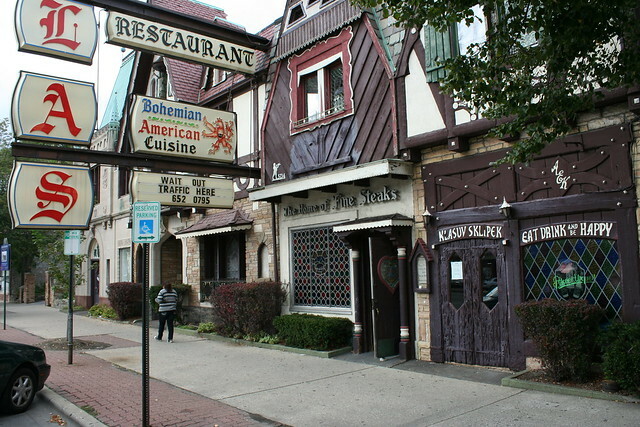 Built as a home to the Sokol youth fitness and community movement – a Bohemian equivalent to the German Turner clubs – the building was a center of Bohemian life in Chicagoland, with a gym, pool, restaurant and more. 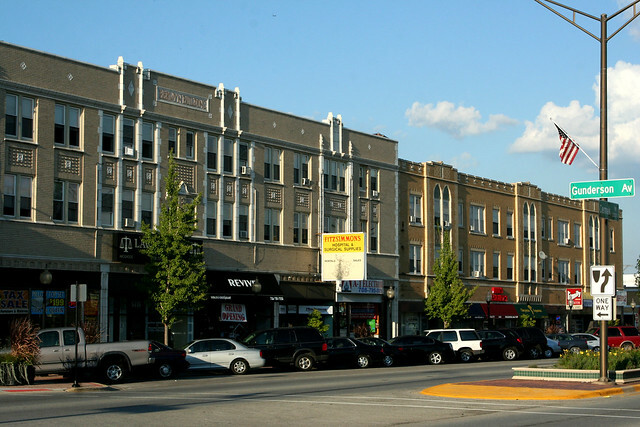 The movement reportedly didn’t last long in the building, which was foreclosed on in 1933, but the Sokol maintained a presence there at least into the 1950s, and theater has continued on in various incarnations to the present day. 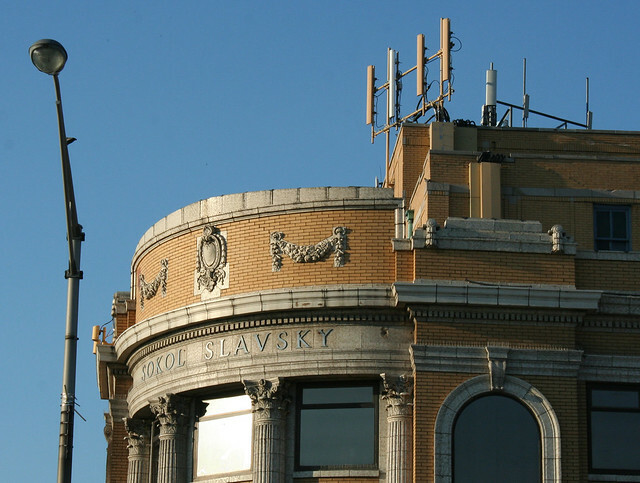 If Sokol Slavsky is the queen, then the prince is the Majestic Building (6114-6126 W. Cermak, Cicero), just to the east. 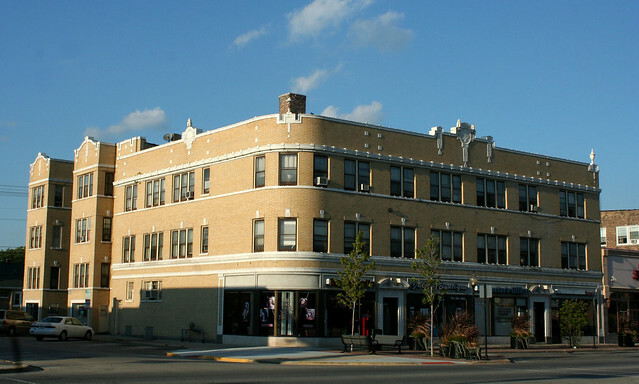 This lovely mixed-use building features apartments on the side, stores at street level, and office space in the front upper floors. 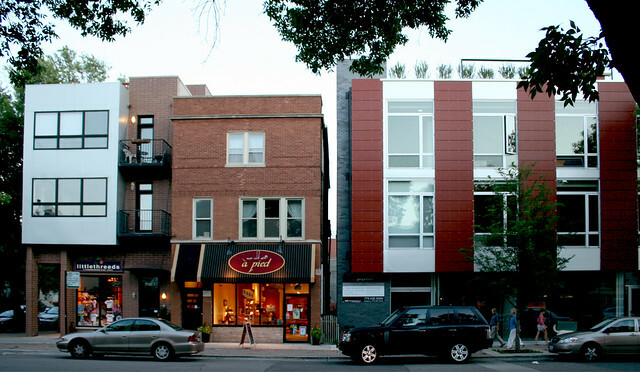 It presents a more domestic aspect to the side street, where a U-shaped courtyard faces the street, somewhat softening the transition from commercial Cermak to the bungalows of the neighborhood. 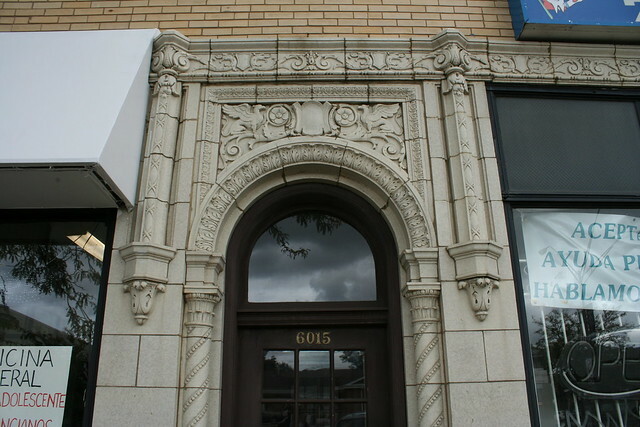 Fantastic Gothic detailing marks the office entryways on the Cermak side. 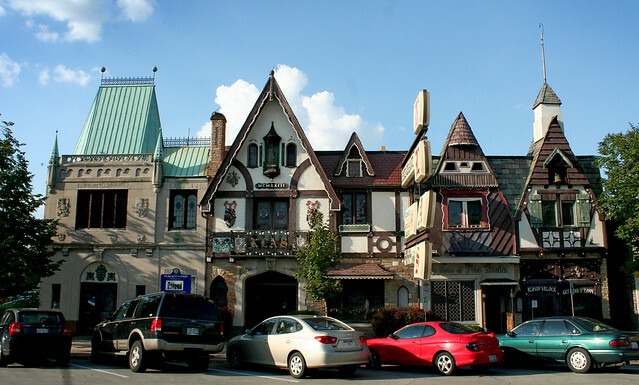 Tudor Gothic elements show up elsewhere as well, such as the faux quoins around the windows and the plentiful medallions and battlements along the roofline. 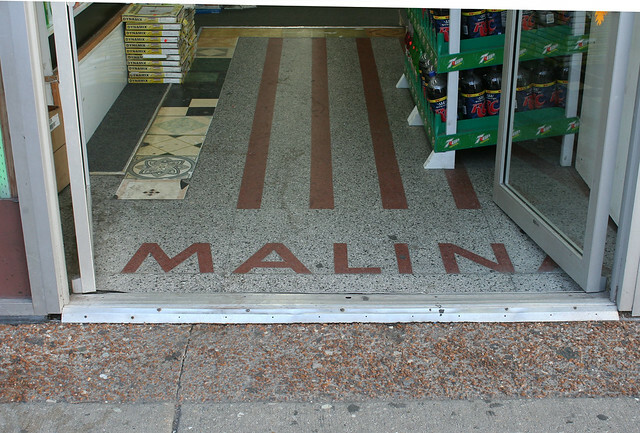 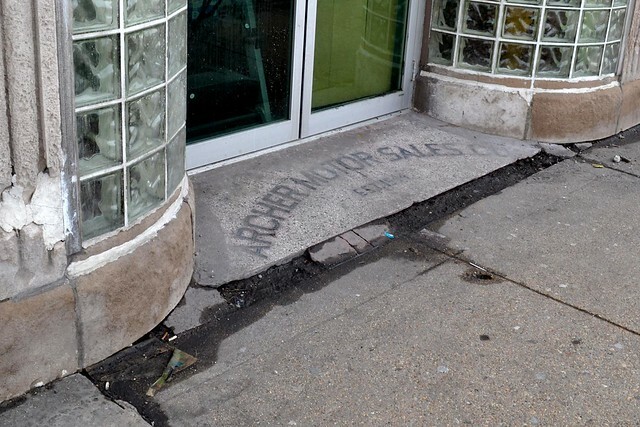 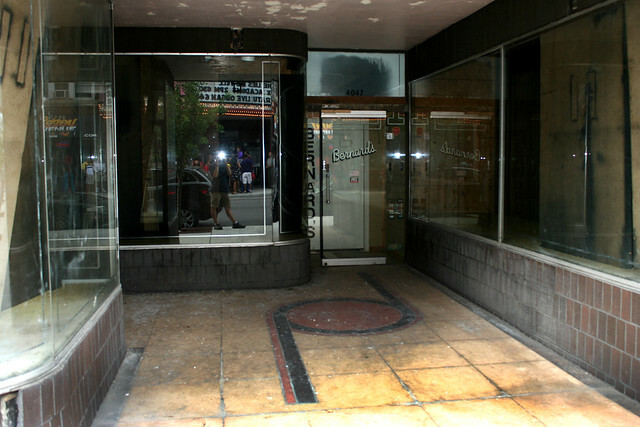 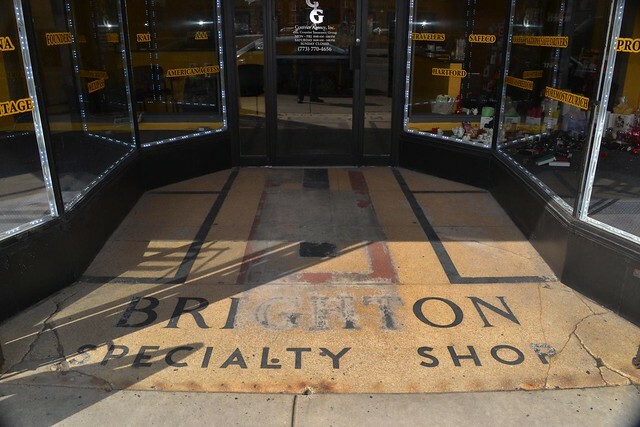 A healthy run of storefronts still surrounds the base of the building, some with 1950s or 1960s storefront installations featuring terrazzo floors and Roman brick. 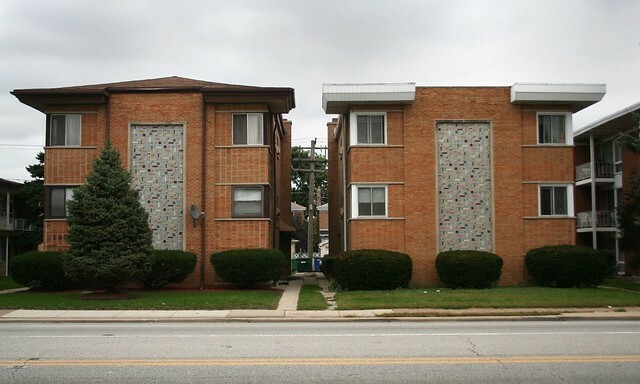 Apart from these two grand dames, there’s a whole cavalcade of brick and terra cotta encrusted buildings lining Cermak. 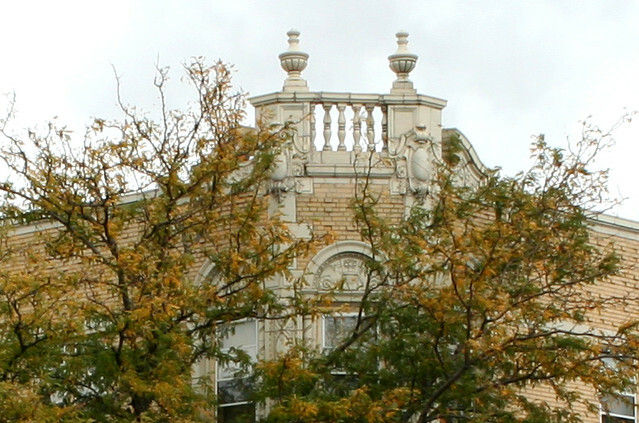 6424-6436 W. Cermak Road, Berwyn – featuring Gothic-styled window heads on the third floor, and battlements on the roofline. 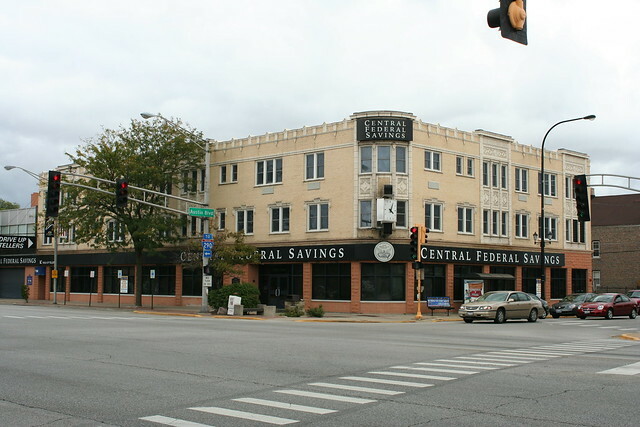 Central Federal Savings has a been a corner tenant at this building since 1939 (they replaced a Sears when they moved in.) 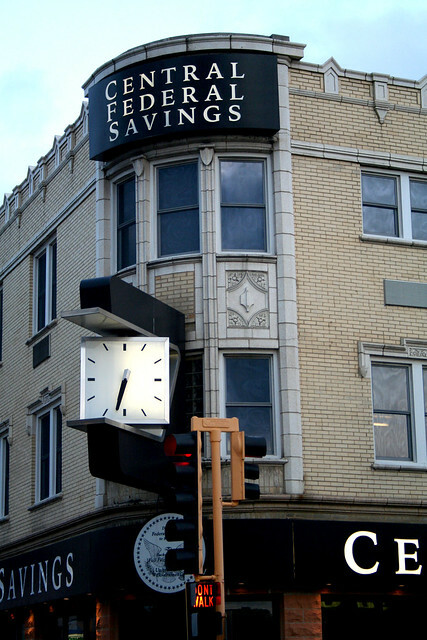 Their original mid-century storefront has been remuddled into something far less interesting, but they still have an excellent Moderne rotating clock that projects out from the building’s corner. 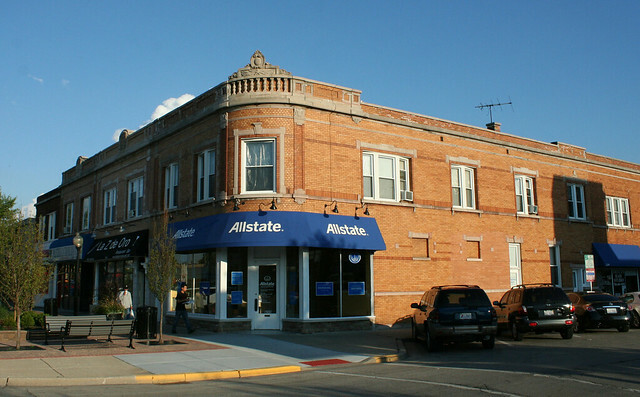 The building itself is in a handsome shade of blonde brick, with plenty of white glazed terra cotta Gothic details on the two upper floors. 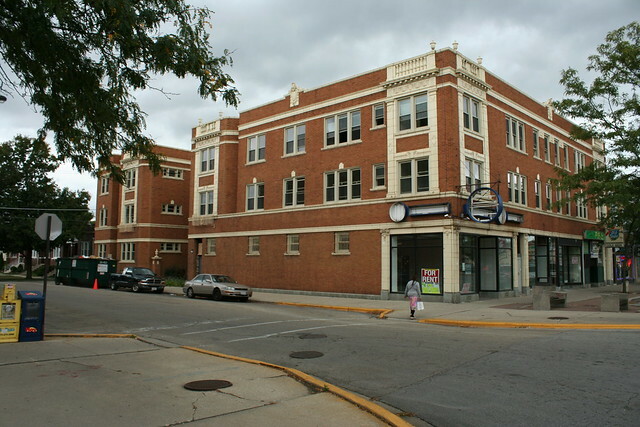 Those floors were most likely apartments when the building was constructed, but the former entrance – at middle-left in the photo above – has been bricked over, and it seems that Central Federal Savings has occupied the entire building. 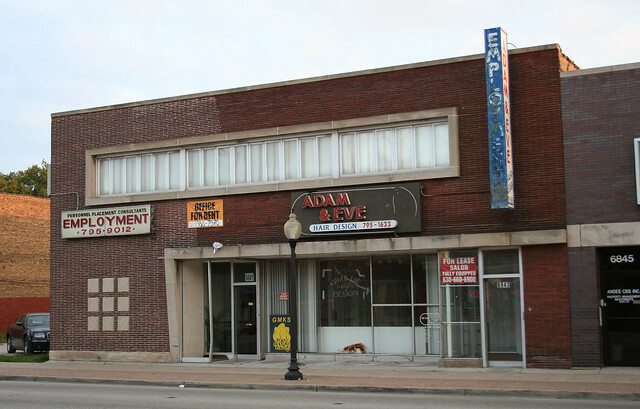 6318-6324 W. Cermak Road, Berwyn – another blonde brick three-story building, with a much more intact ground floor. 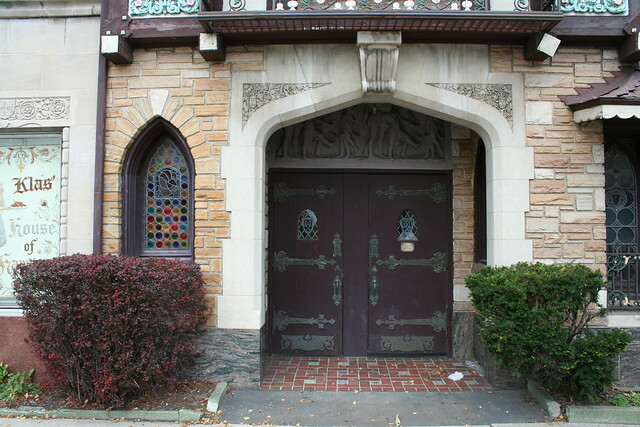 The rounded corner acknowledges the corner site, while several Sullivanesque terra cotta medallions enliven the roofline. 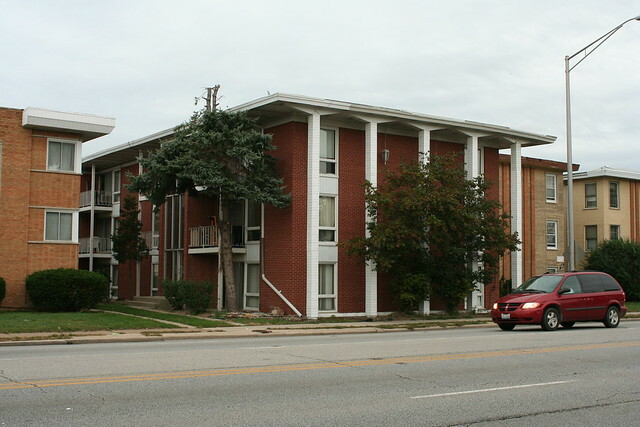 The courtyard apartment building at left is a separate structure, though designed in a harmonious style and built directly against its commercial neighbor. 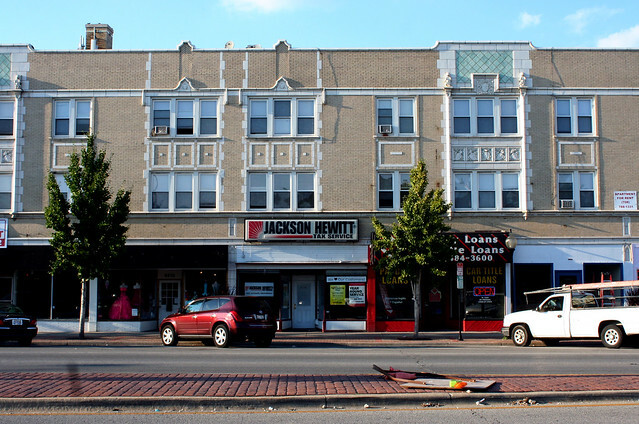 The Ruth Building, 6011-6025 W. Cermak, Cicero – a third blonde brick structure augmented with white terra cotta. 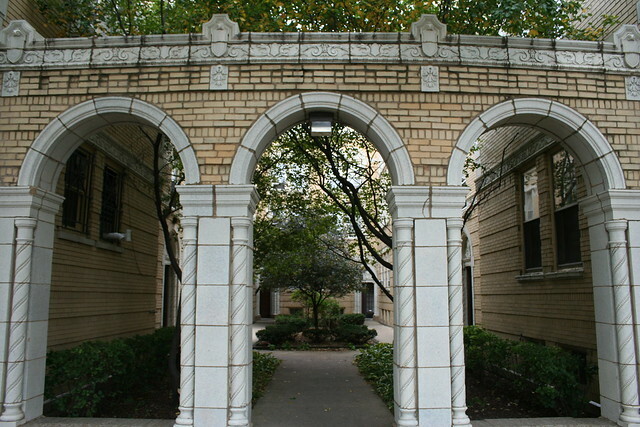 Like the Majestic Building, this one has an integrated apartment courtyard facing the side street, with this lovely tripartite arcade providing some separation from the sidewalk. 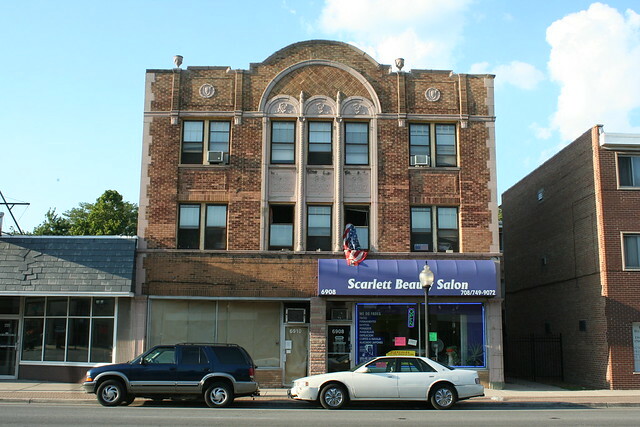 6127-6133 W. Cermak Road – a red brick building with cream terra cotta ornament in a Classical vein, with faux ballusters and dentalated cornice over the corner window, and vase-shaped finials and large cartouches at the roofline. 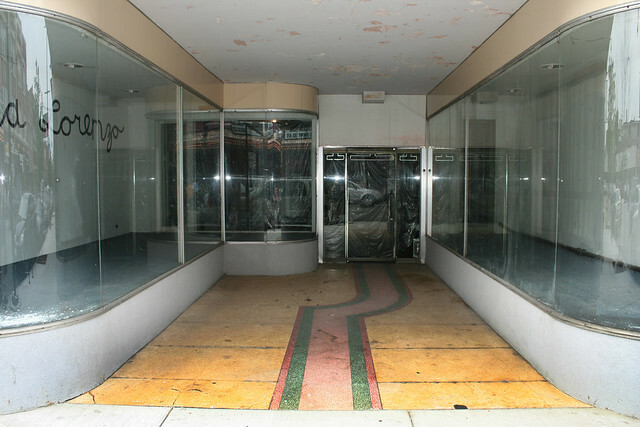 Down on the ground floor, some of the storefronts have been bricked in, leaving only small 1940s Modern windows. 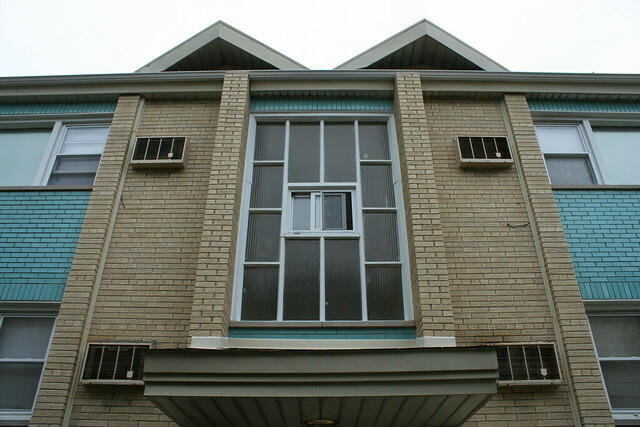 An apartment courtyard faces the side street. 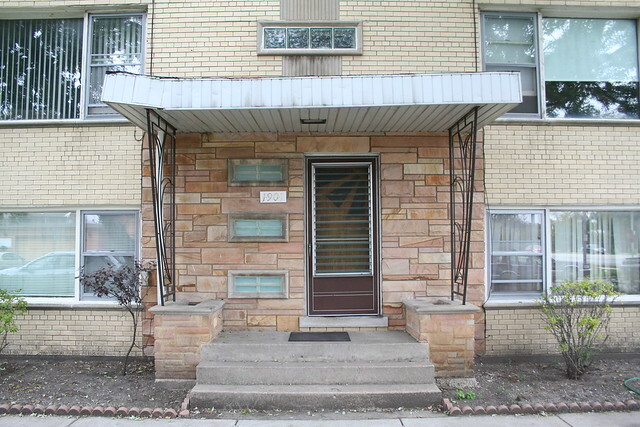 6241-6243 W. Cermak Road, Berwyn – orange-toned brick with carved limestone ornament in the classical mode. 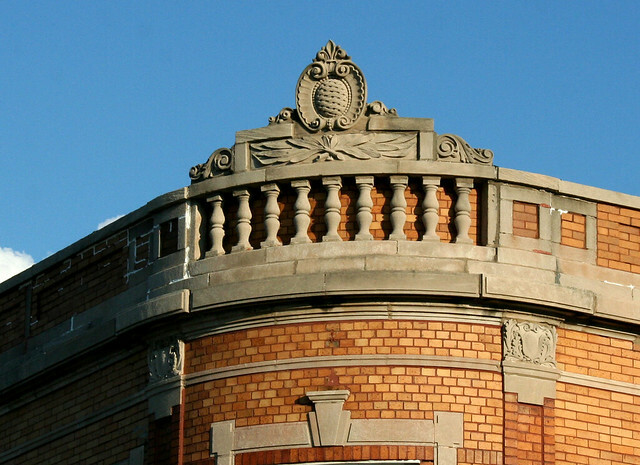 The crest over the round corner includes a faux ballustrade, capped with a medallion. 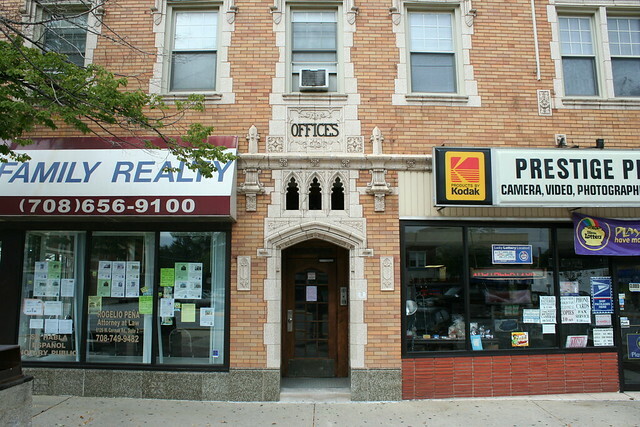 6226-6232 W. Cermak Road, Berwyn – Tudor Gothic in red brick and carved limestone. 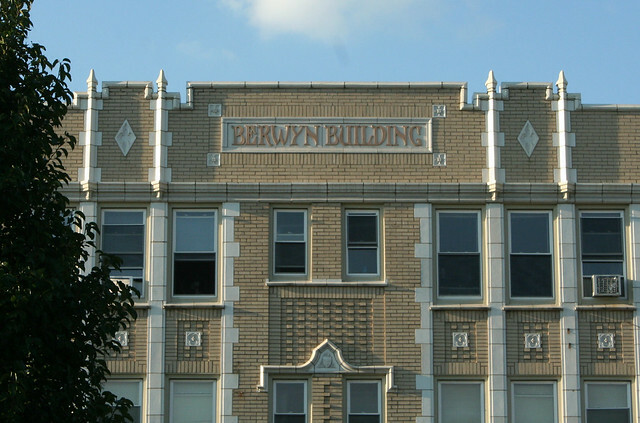 A pressed tin cornice in need of paint sits above the third floor windows. 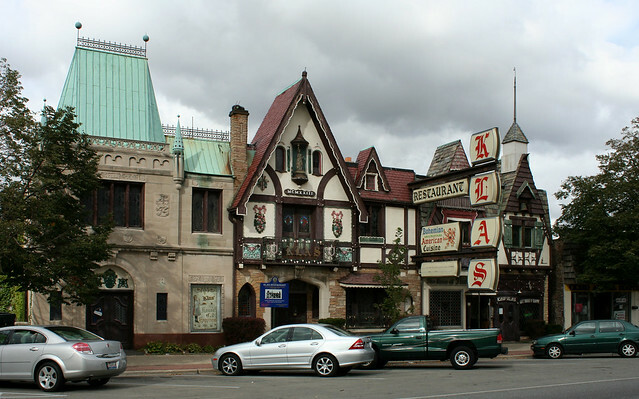 A number of smaller buildings also contribute to the area’s architectural significance. 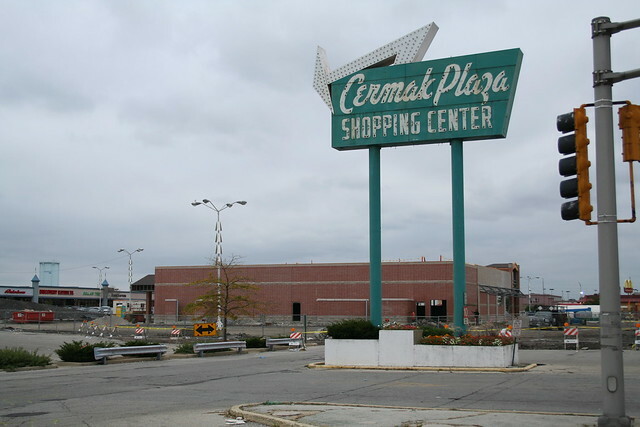 The Great Depression put a sharp halt to construction on Cermak; large-scale building would not resume until the 1950s – in a new and different style, influenced by the newly dominant Modernism. 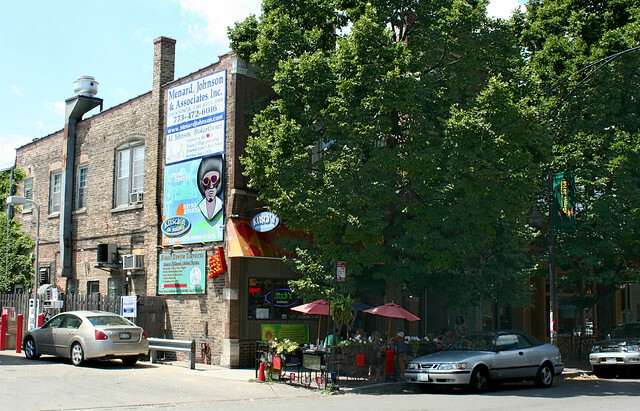 Tucked away north of Belmont, running east-west between Western Avenue and Damen, lies one of Chicago’s great open secrets, the commercial district of Roscoe Village. 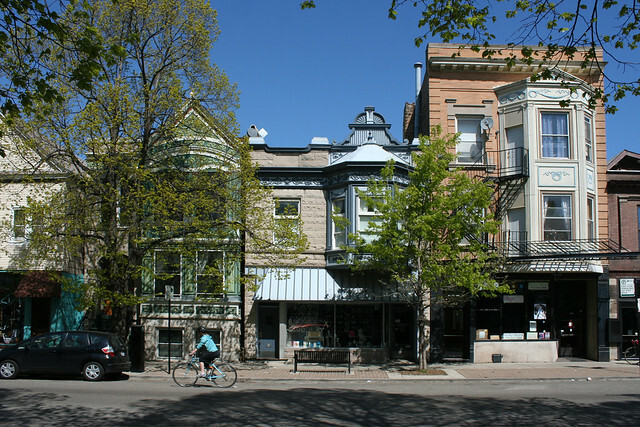 For several blocks, this peaceful, tree-line street is laced with small restaurants (a few chains, but mostly local), stores and shops, delightfully intermingled with houses and apartments, both old and new. 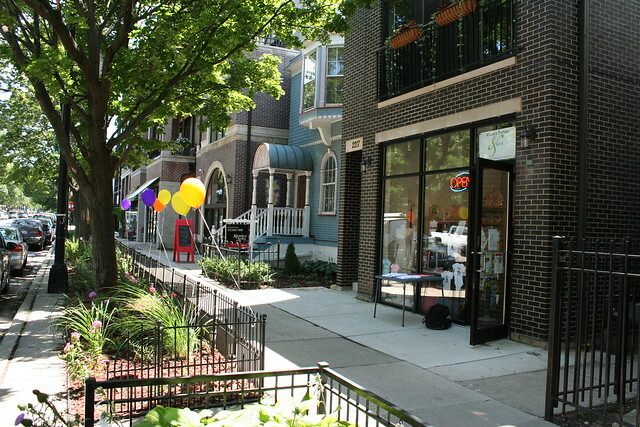 It may well be the prettiest commercial strip in the city of Chicago. 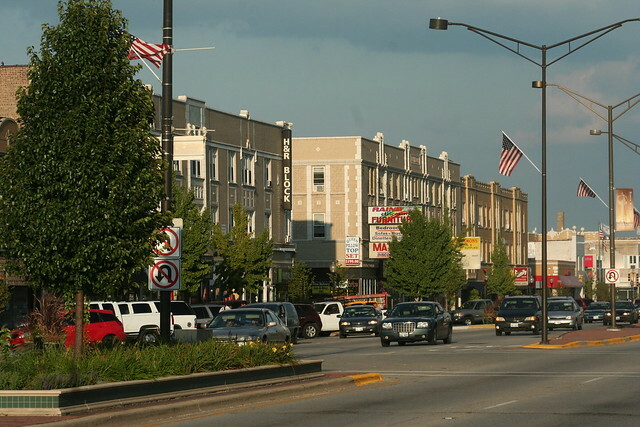 Roscoe is not a street you would naturally tend to find yourself on; it is not one of the city’s major arteries, with Belmont only a few blocks south. 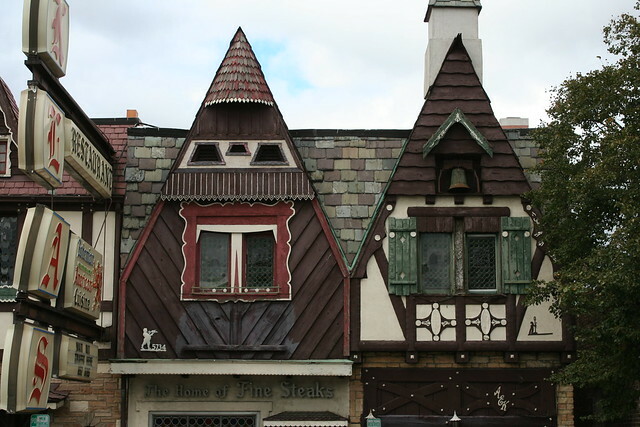 And its architecture is not great art; in fact it’s hardly noticeable at all. 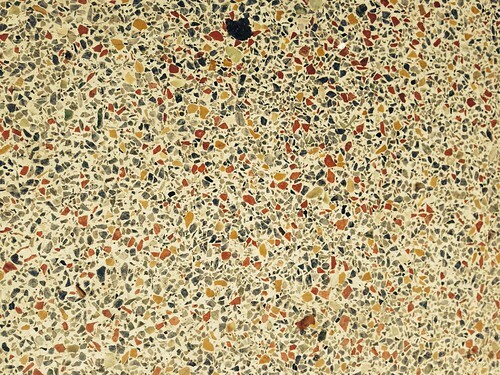 It blends into the background – a stage set, subservient to the performers. 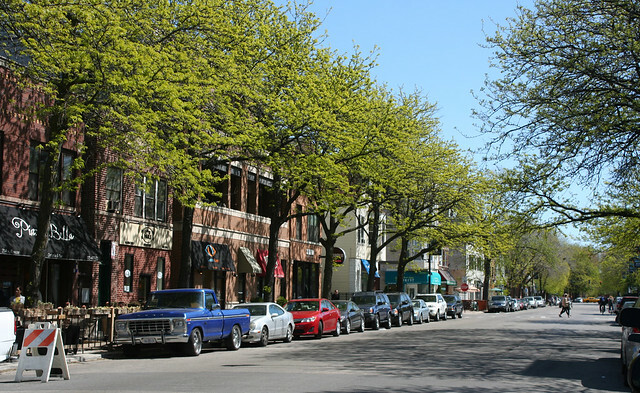 What truly brings the street together and makes it sing are the trees. 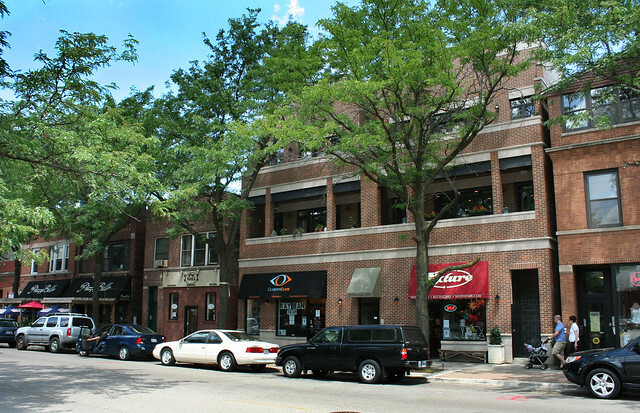 For blocks, the sidewalks are gently sheltered by great branches that overhang street and walkway alike. 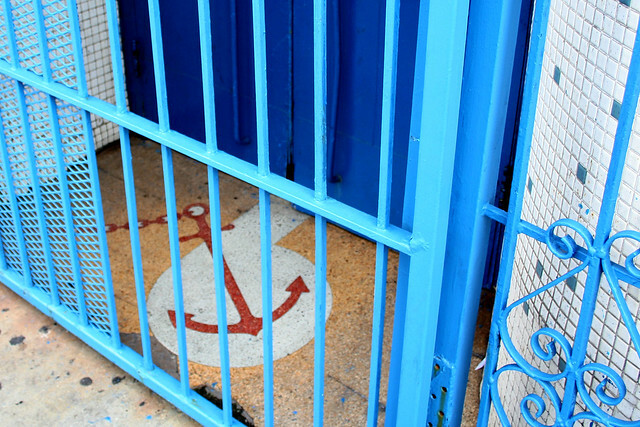 There is an intrinsic comfort to the place. 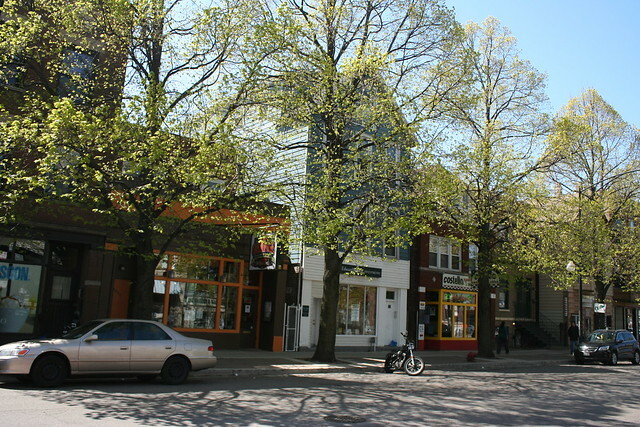 And the difference is perfectly illustrated by the gas station on the corner of Roscoe & Damen, where the trees come to an abrupt and unfortunate halt. 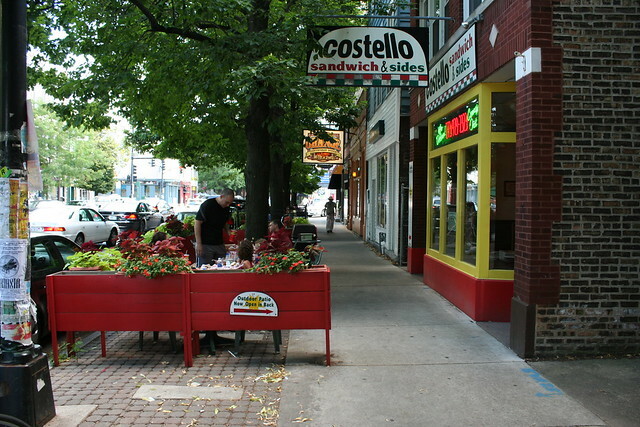 Some of the restaurants have wisely enhanced that sense of sheltering space with the layout of their sidewalk seating. 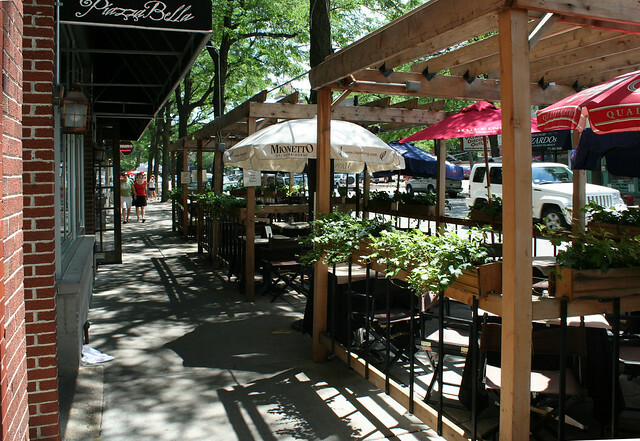 A second layer of open enclosure makes the outdoor dining along Roscoe utterly irresistible – a perfect model of urban space. 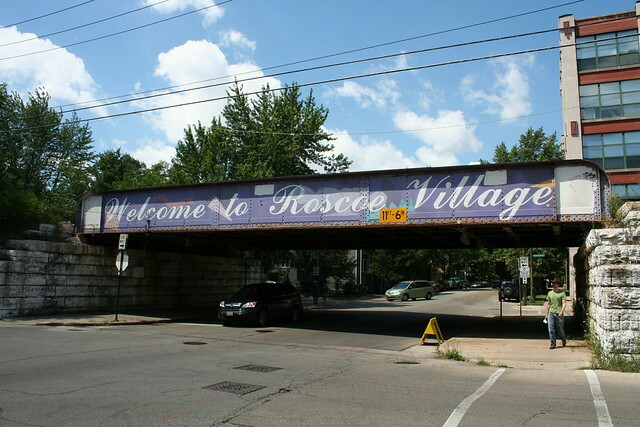 The name “Roscoe Village” doesn’t appear in the Tribune archives until 1975. 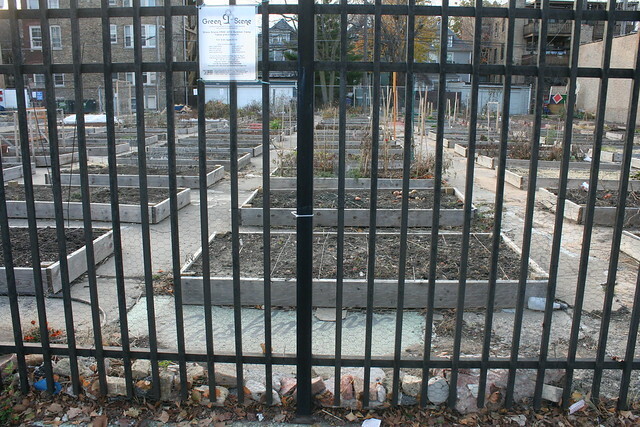 The original European settlers on this land built greenhouses, part of a booming produce industry based in and around the Lincoln Square area. 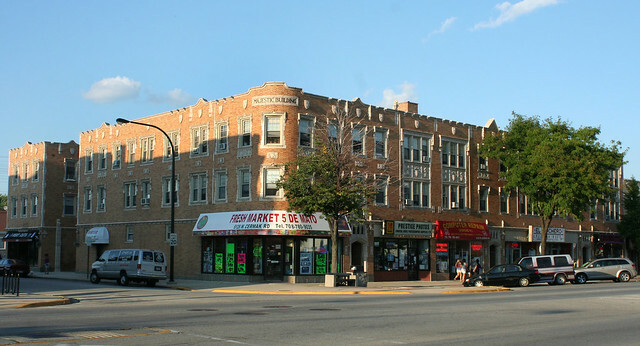 Industrial development along the Ravenswood rail corridor, and the success of the Riverview Park amusement park on Western Avenue post-1903, caused the land around Roscoe Street to develop rapidly with stores and worker’s flats. 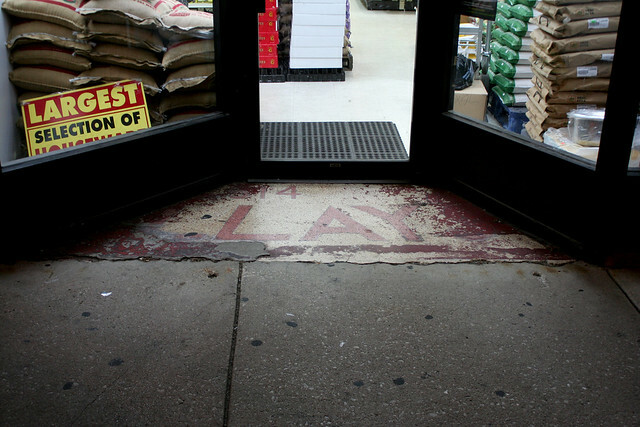 The area suffered through a long funk from the Depression into the 1970s, but then began lifting itself up by the bootstraps. 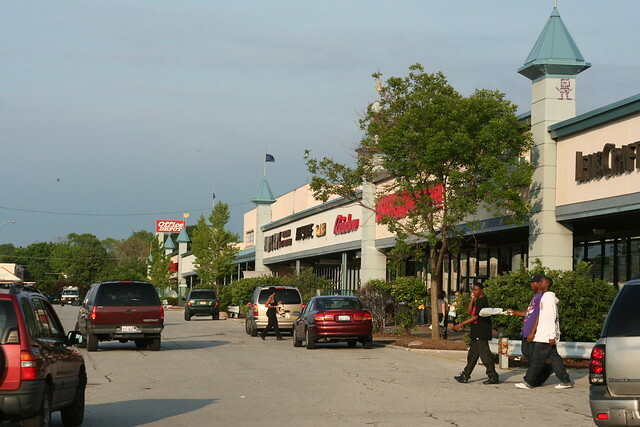 By the late 1980s, the area was booming as low rents attracted first-time store and restaurant owners who couldn’t afford pricier locations east and south; the street was for a time a mecca of 1950s and 1960s retro design and nostalgia. 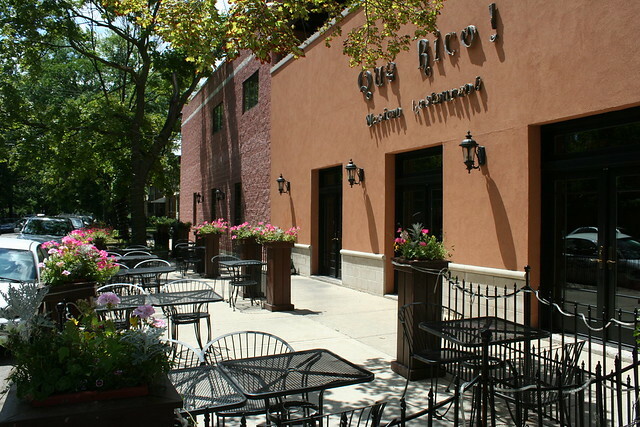 Today there are a healthy mix of chains and local restaurants, and all the charm you could want.